We arrived around 10AM at Gatwick and in a very short time, we’re on our way to Cornwall. The day was overcast and cloudy…cool but not cold. We drive the M3 until we get off on one of the “A” roads, taking us through Salisbury Plains, where we see Stonehenge in the distance, but don’t stop. We arrived just before 8PM…a long day on the road, and we were tired out. Leslie drove to the moors, I took over the drive from there…a bit tense getting used to the left hand side of the road all over again. 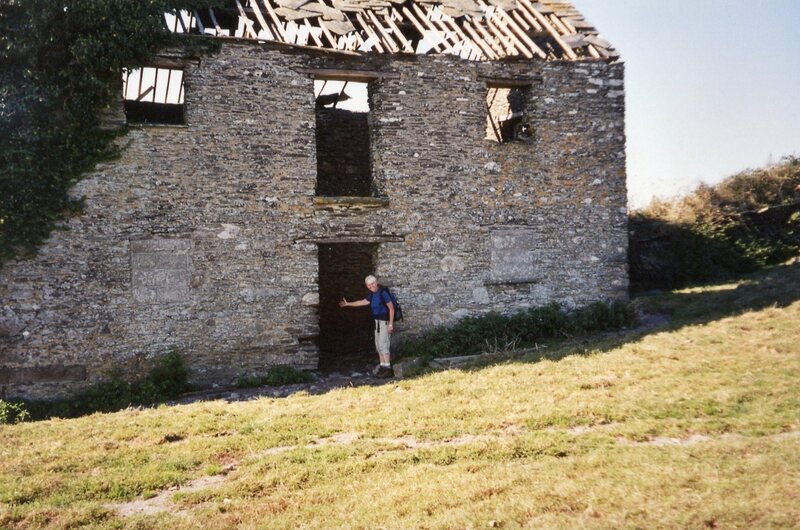 Anyway, once at Polraen, we were able to settle in! 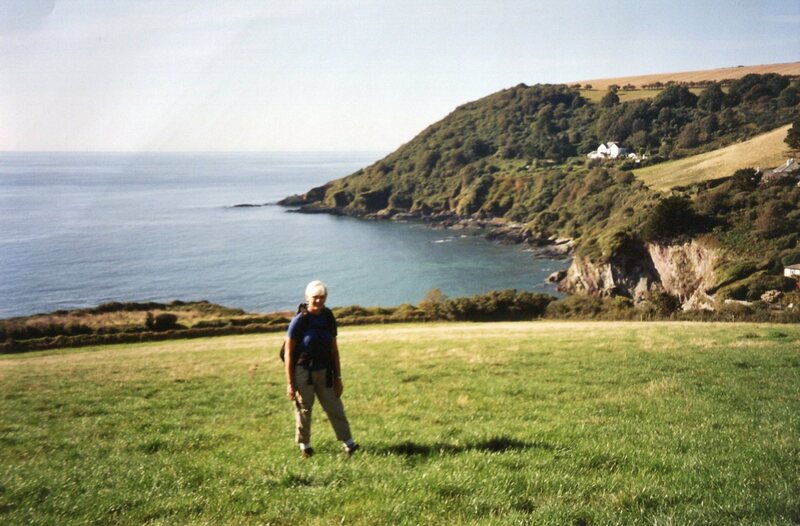 Polraen House is just outside Looe, on a hill, rather isolated, in beautiful country. The house is old – half was built in the 1750s/half in the 1850s. 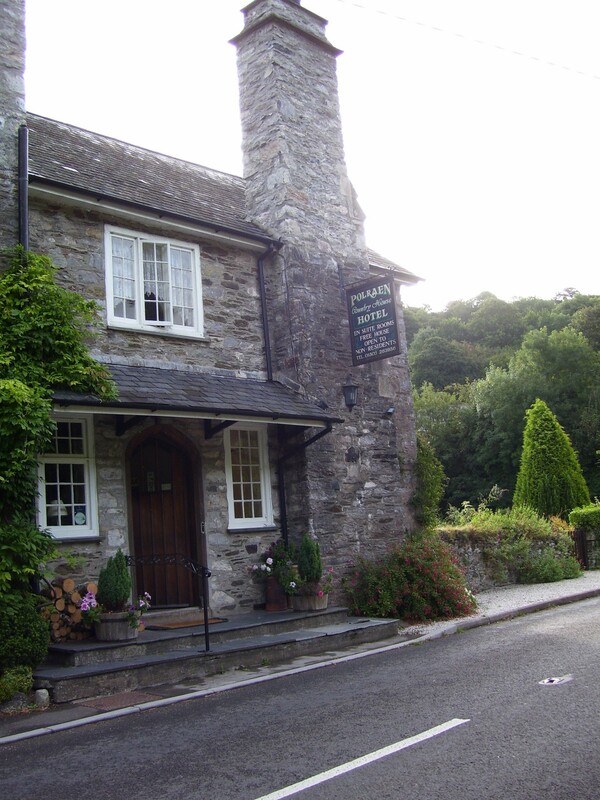 Unusual for a B&B, it has a comfy little pub and a pretty dining room. Martin is a hoot – so funny, and very welcoming – he met us at the front door on our arrival. 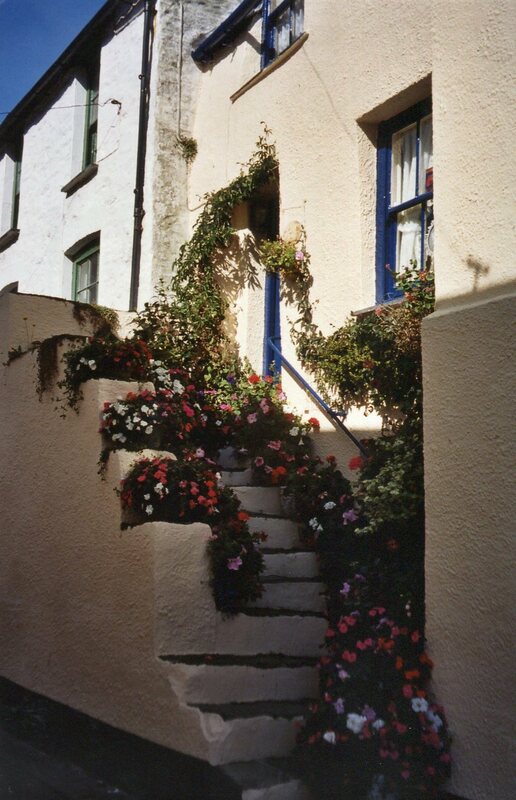 The façade of the house is Cornish stone; flower baskets hang on the grey stone walls. 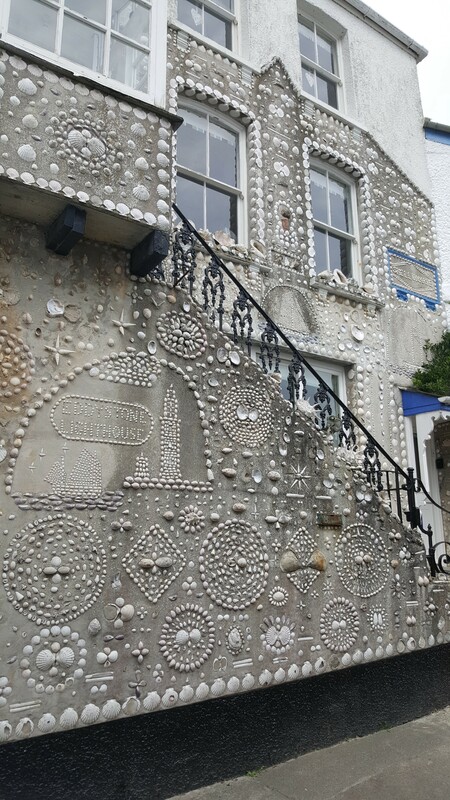 It’s totally Cornwall, and utterly charming. We tidied up and immediately went downstairs for one of the yummiest dinners ever – Martin is an amazing chef. Leslie and I had spinach frittatas, Elisa had a salmon “starter” and an absolutely incredible little steak. For dessert, I had fruit and clotted cream and Elisa and Leslie, apple crumble with cream – Yum-o. And the bread – and the Cornish butter – a deep, rich yellow with flavor unlike anything over here in the States (at least anything I’ve eaten). Doesn’t come any better than this. 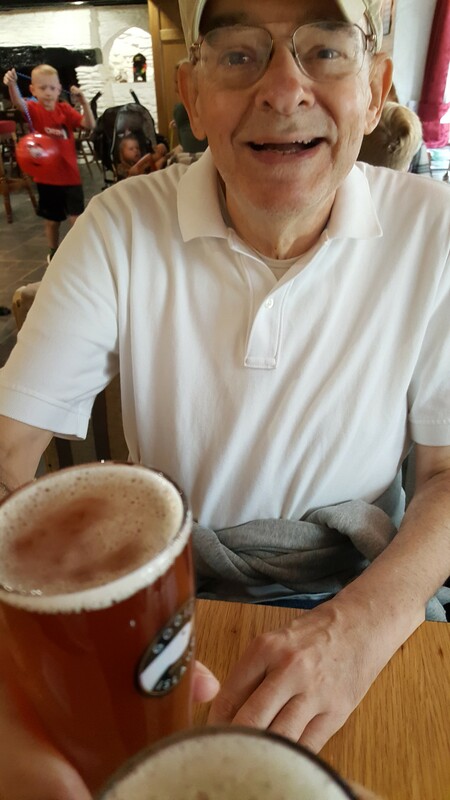 (Before dinner, we had a drink in the pub – so by the time the day was over, we were out like lights. 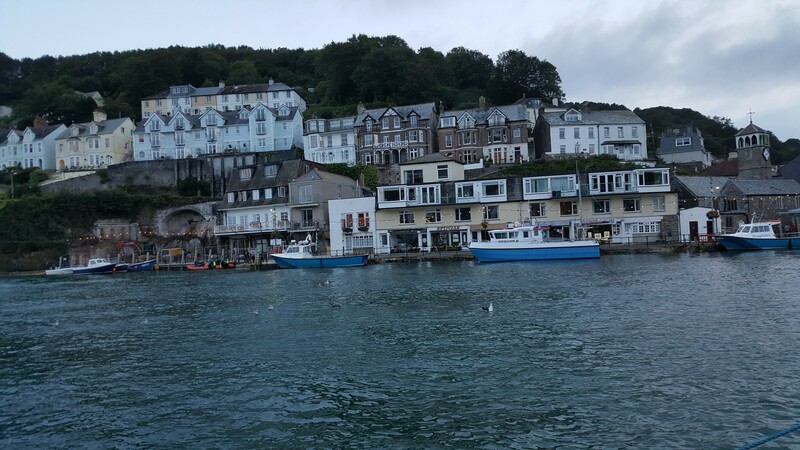 Got up for a wonderful English breakfast – eggs, bacon, sausage, fried tomato, fried bread, basket of these terrific baguettes, Cornish butter (may as well just apply it to my hips) – then Martin drove us to Looe to start our walk. The Coast Road out of Looe onto cliffs overlooked a silver sea. 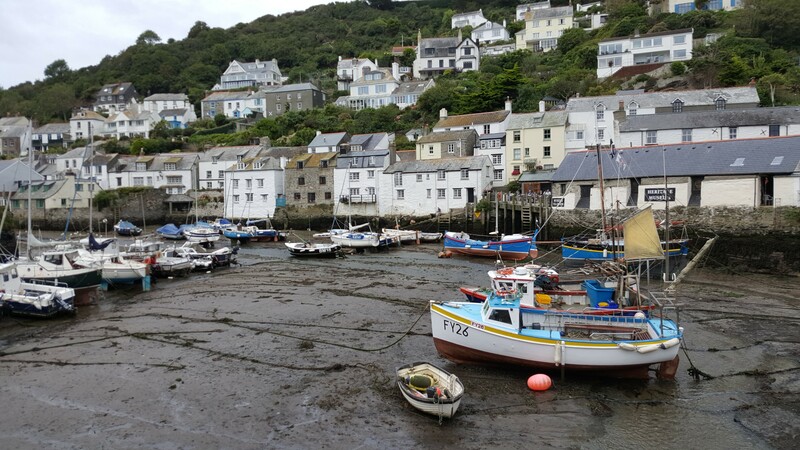 It was a beautiful day – intermittently cloudy and sunny, perfect for walking the six miles to Polperro. 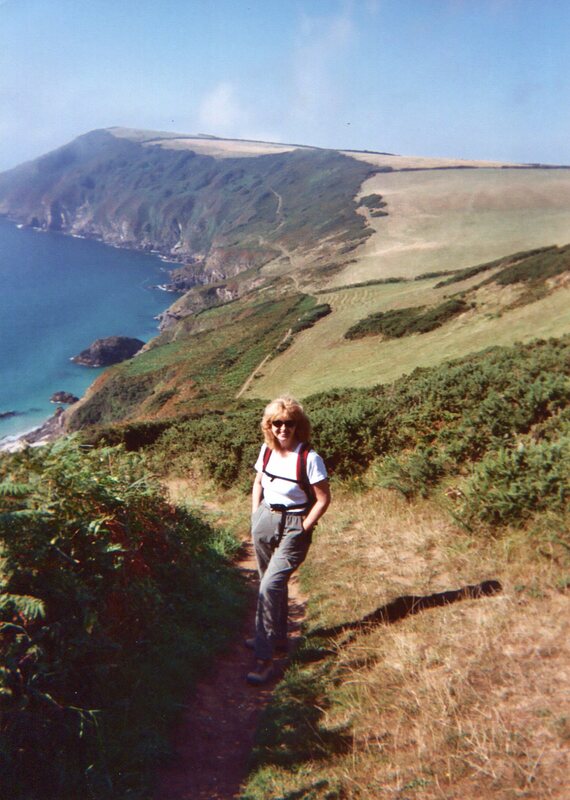 We reached Talland Bay (halfway to Polperro) and stopped for a break, then I ran up the hill to see if Allhays <an old B&B manor house that was my favorite of all time> was still there. It was – just as pretty as ever, and still called Allhays, but now a private home. 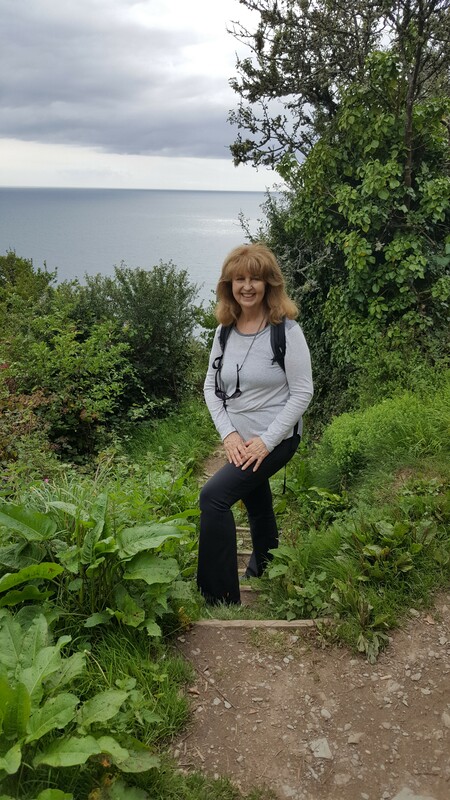 I snapped a few photographs, then it was back down the hill to catch up with Elisa and Leslie on the coastal footpath to Polperro. The views from this path are breathtaking: long green cliffs soaring to a crystal blue sky, and water the color of pearls. 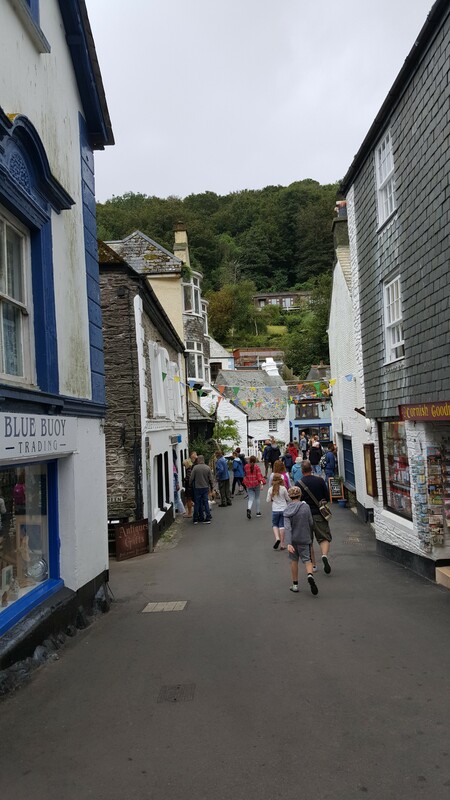 I have done this walk so often, and I still love it – and Polperro is still as delightful as ever. By this time, the sun was out in full. We kept running into the same nice couple on the road, and they took our “group” photo. 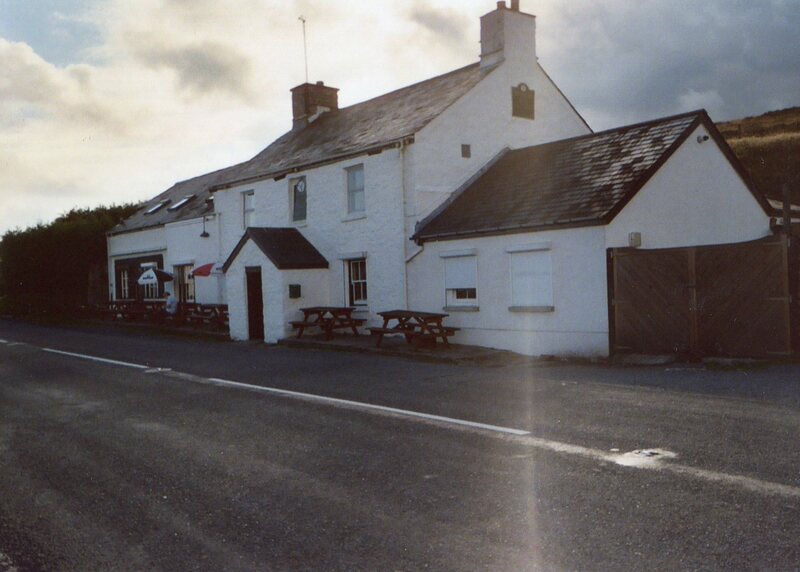 We had a little lunch at the Noughts and Crosses Inn – finally, a Cornish pasty – accompanied with shandy and Guinness. 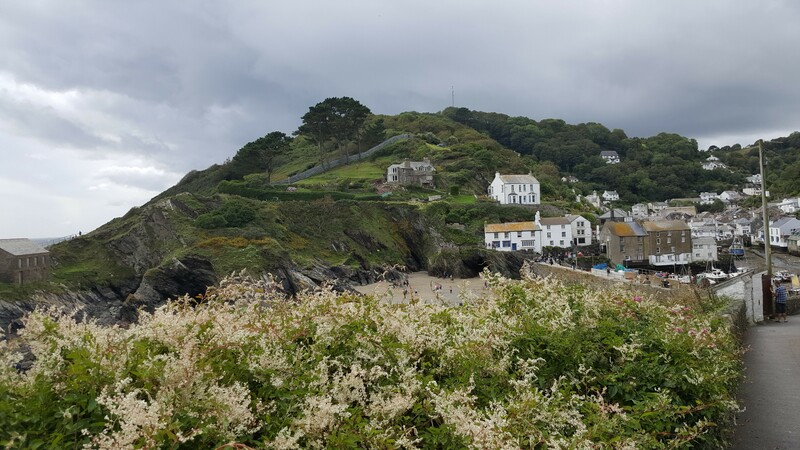 We rambled around Polperro, looking in shops and the post office (which offers far more than just postage stamps), and finally climbed up the hill to the bus stop at Crumplehorn. After a half an hour wait, the bus arrived –off we went, clattering and banging in the narrow narrow hedge-rowed lanes – at a knee-shattering speed – across the bridge and river that splits Looe into East and West; it finally dropped us at our front door at Polraen. Very nice! Great not having to drive for a day. Dinnertime: Martin had prepared scallop salad for Leslie and me, and prawns in garlic for Elisa. Again, the wonderful baguettes and rich yellow Cornish butter. Then we shared Grand Marnier bread pudding. Breakfast: Greek yoghurt with Alpen – yum-o. It was absolutely incredible yoghurt! 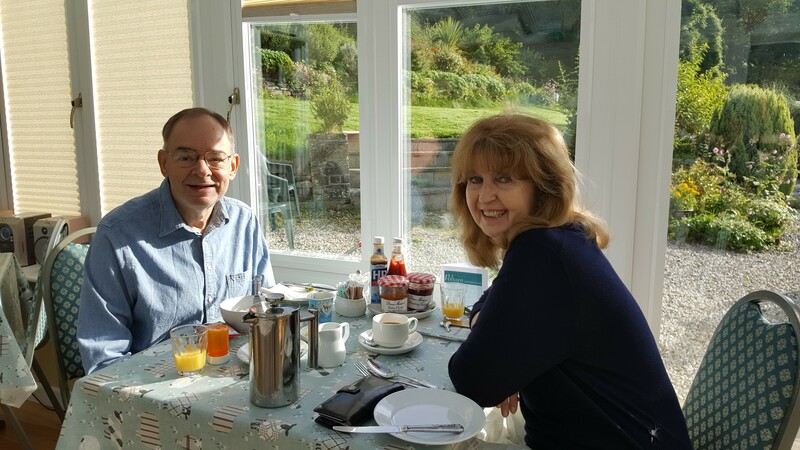 Elisa and Leslie had a full English breakfast – these certainly keep you going all day. 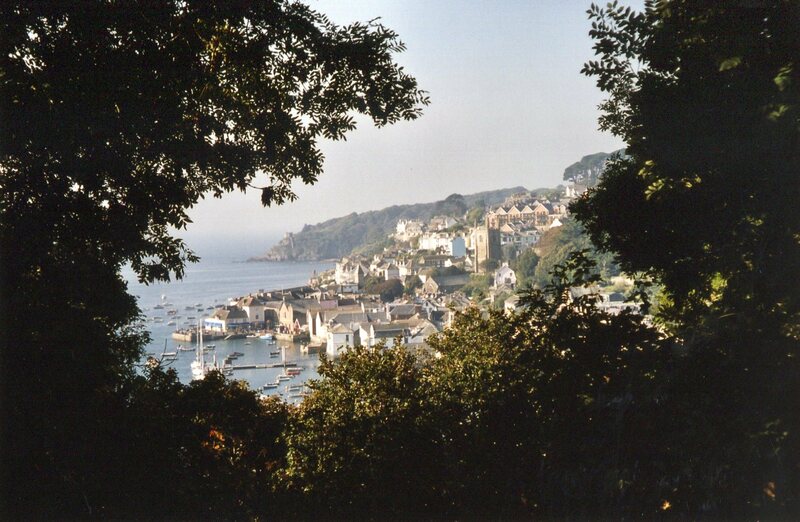 We decided to go to Fowey to hike around town. 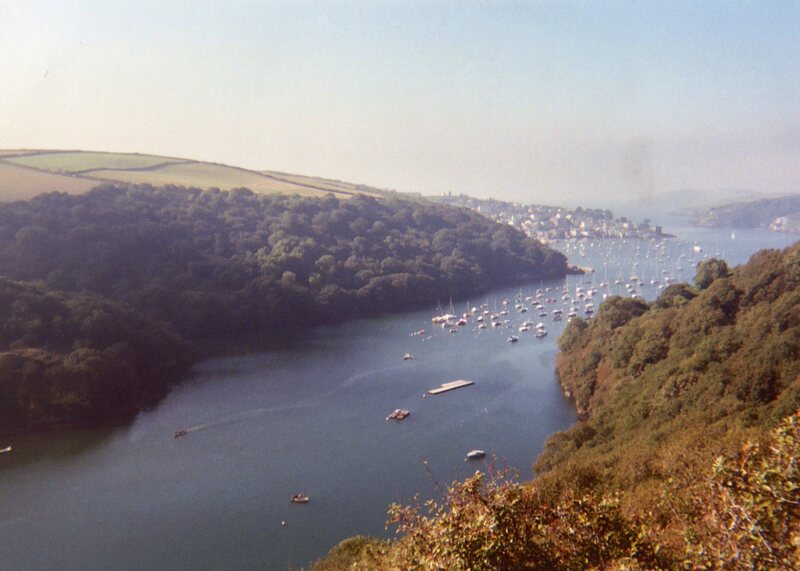 We drove to Polruan, parked the car, and walked the 1.5 miles to the foot ferry, which took us to Fowey. The day is on/off sunny and cloudy; we lose our way almost immediately, but end up walking around Fowey on roads rather than footpaths. The roads are pretty and lined with lovely old houses, fun to look at, and the flowers and greenery are lush, lush, lush. Finally, back at the town center, we have a latte at a small pub called Safe Harbor. Very comfortable and relaxing. Not a real hike, but good for the legs and rear! 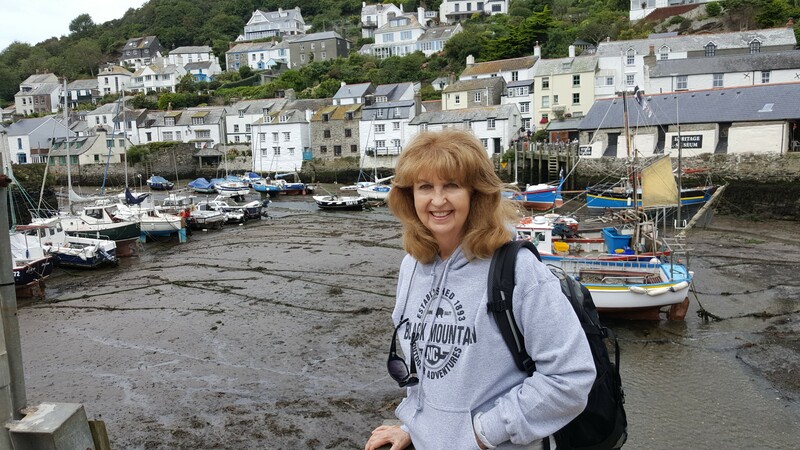 We caught the ferry back to Polruan, and Leslie and I walked to the car park – another 1.5 miles uphill – to pick up the car and pick up Elisa. And it’s back to Polraen House for a drink in the back garden…it’s turned into a lovely day, and Polraen’s garden backs onto a green green hill with horses grazing across it…so beautiful. The sun was out, and everything was peaceful and quiet. Then another gorgeous meal: Leslie and I have a veggie meal – veggie soup puree (pea-based) and for the main course, new potatoes in butter, beans and carrots. Absolutely the best – and the baguettes and Cornish butter – well, words are beginning to fail me, although apparently not my appetite. Martin is one of the best chefs – I’ve never had such wonderful food. And so again to bed. 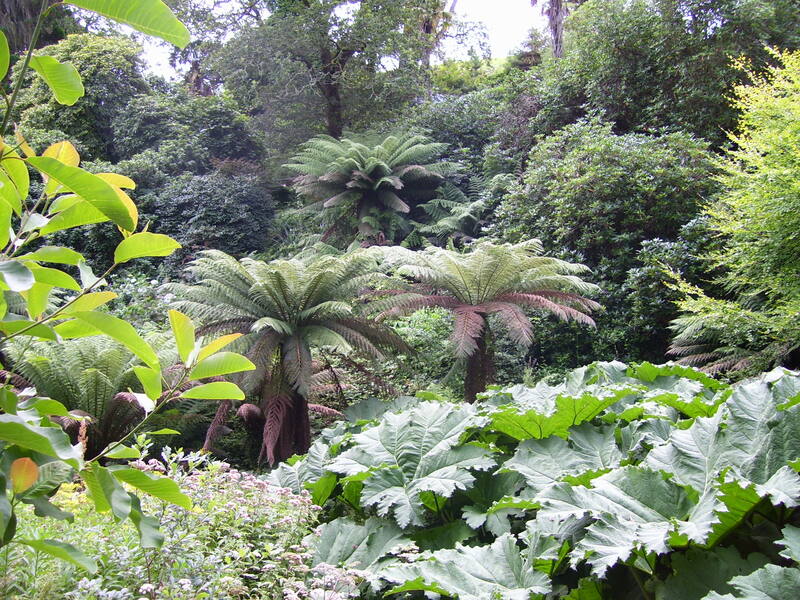 Up around 7:30, today we plan to go and see the Lost Gardens of Heligan, St. Mawes and Truro (for its cathedral – but we never make it to Truro). The day is cool and cloudy. 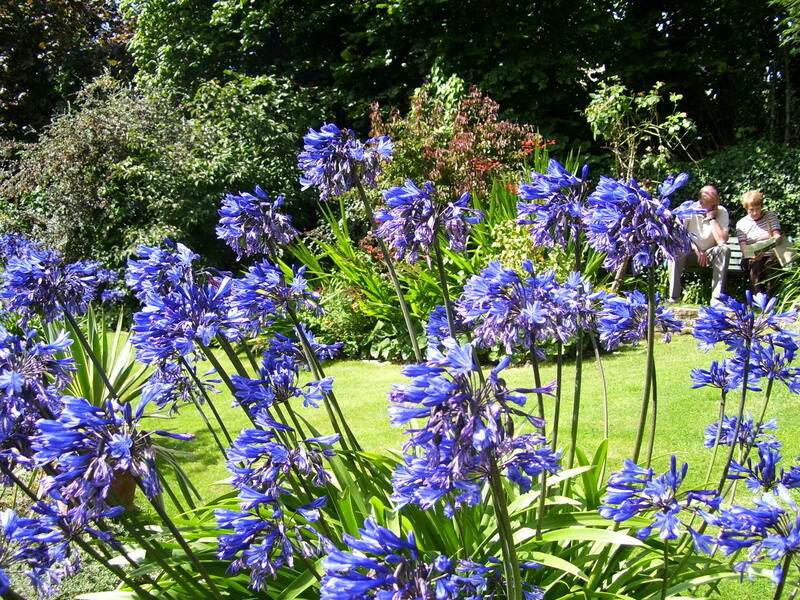 By the time we reach the Gardens, the sun has come out and the sky is absolutely vividly blue. The Gardens’ 200 acres are beautiful, sectioned off into specific type gardens, such as the Jungle Garden, Italian Garden, Asian Garden, etc. 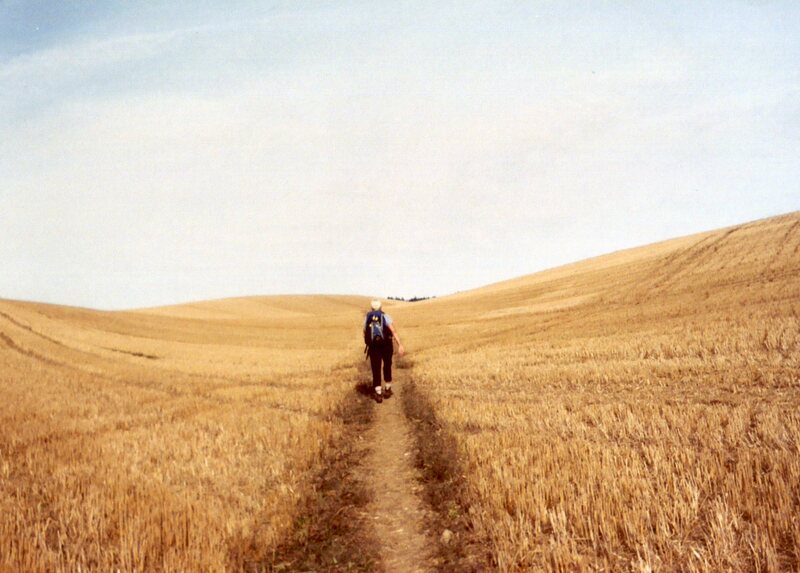 They also encompass fields and river walks, which gave us a wonderful walk over fields and along the river…The sun was shining, and the air smelled of flowers. We ate lunch at the Garden Centre – Cornish pasties again…nice! Then on to St. Mawes, which is one of the prettiest villages in Cornwall. 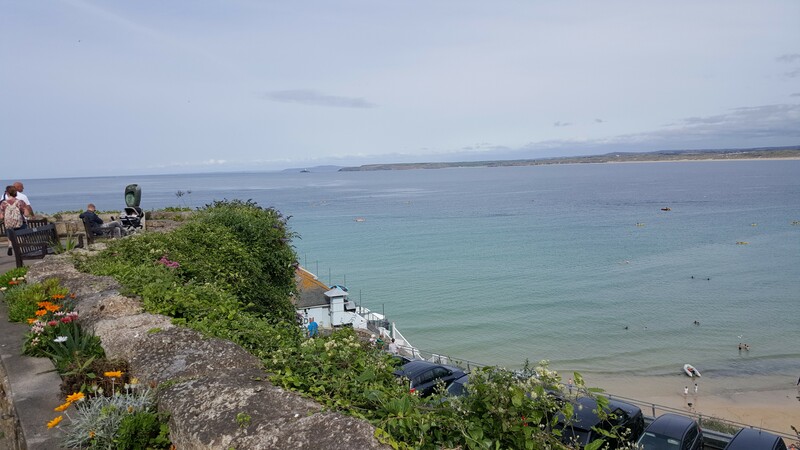 Unfortunately, we arrived rather late, so we saw very little of the village…just toured the little Tudor castle on the hill, and then walked to the sea front, where we stopped for a latte. Martin and Gillian were taking the night off, so we picked up some cheese and rolls and raspberries for an evening snack. There was a slight drizzle of rain by this time, so we turned for our B&B (the only bit of rain during the entire trip). 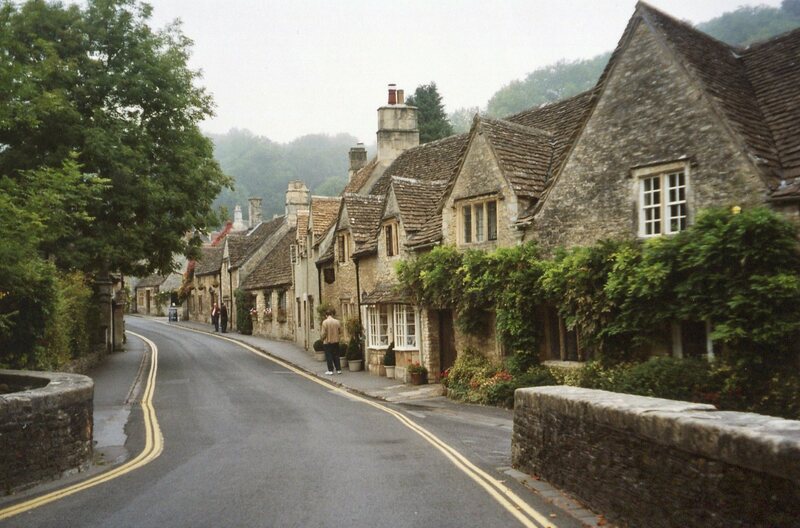 Tomorrow we leave for the Cotswolds! Up around 9:30for the usual yummy breakfast, ready for the road to the Cotswolds. 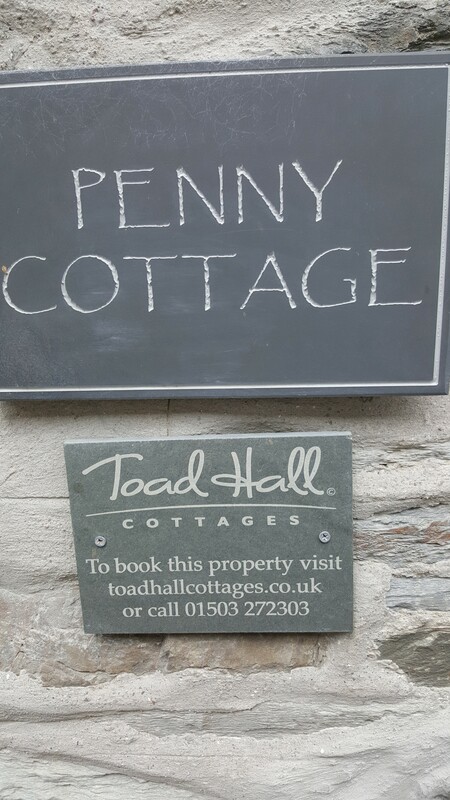 As we our paying our bill, one of the other guests come by to say “someone has a flat…” It’s us, unfortunately. A lot of driving over “kerbs” has finally ended with the expected tire problem. Martin and the guest (fromLuxembourg) labored mightily to change the rather recalcitrant tire. It took an hour – with Martin asking, rather testily at one point as he was bending over the car, if his “bum looked big in checks <his pants>! !” …but everything was finally fixed, and then we were off! 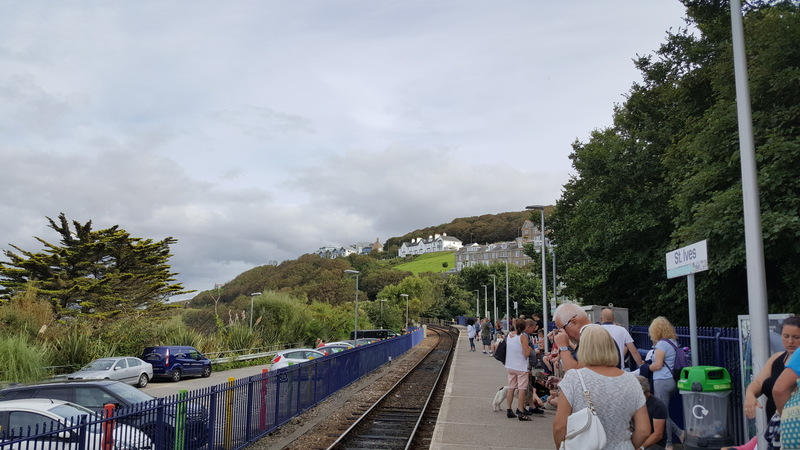 We drove from Looe to Snowshill without further incident, and were able to make excellent time – 4.5 hours – as the weather was clear and sunny. 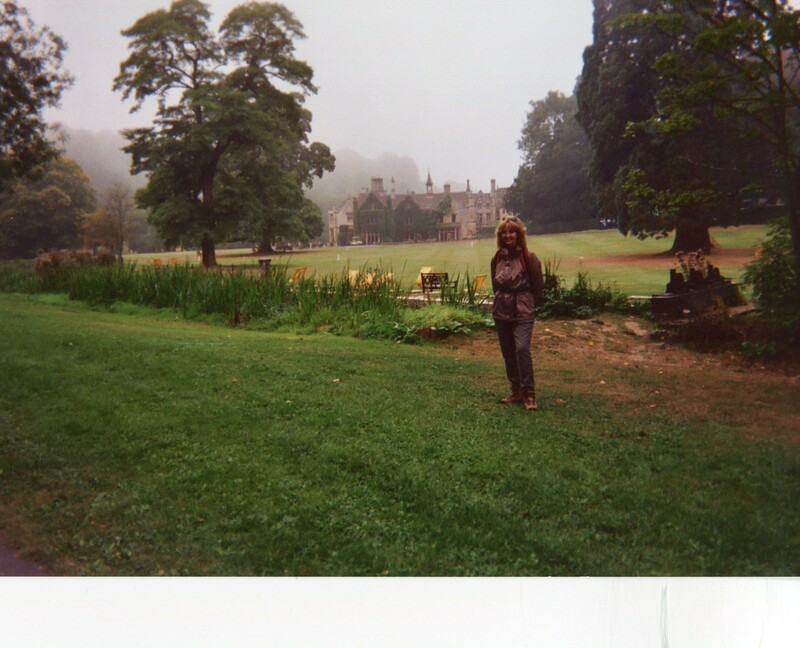 We drove through or around Bristol and Evesham and Broadway, landing at Sheepscombe House around 3:30-ish. Jacki (one of the proprietors) met us and showed us to our rooms. Elisa and Leslie shared a twin bed room in the main house. Mine was up an outside stair – rather a suite, very very pretty. No tub! 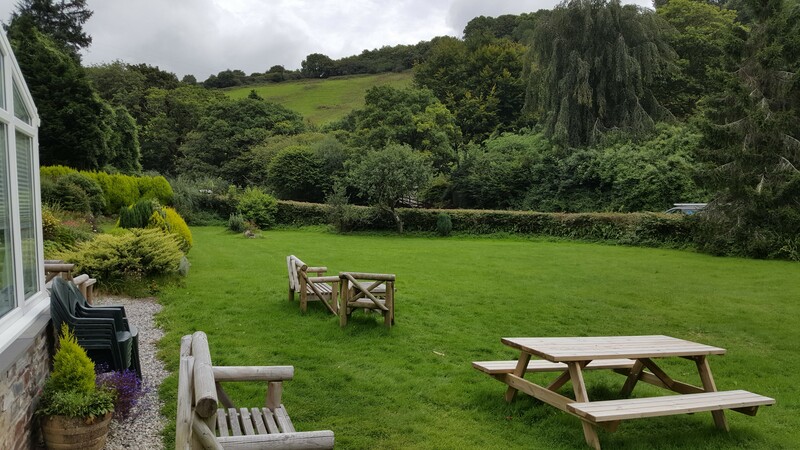 We unpack, ramble around Snowshill – which is one of England’s most picturesque villages, and the setting for “Bridget Jones” movies – then we go to the village pub (Snowshill Arms) for dinner. Pretty much typical pub food, but good. The table by the window looks over the old churchyard and graveyard where “Bridget” sees her parents re-marry. 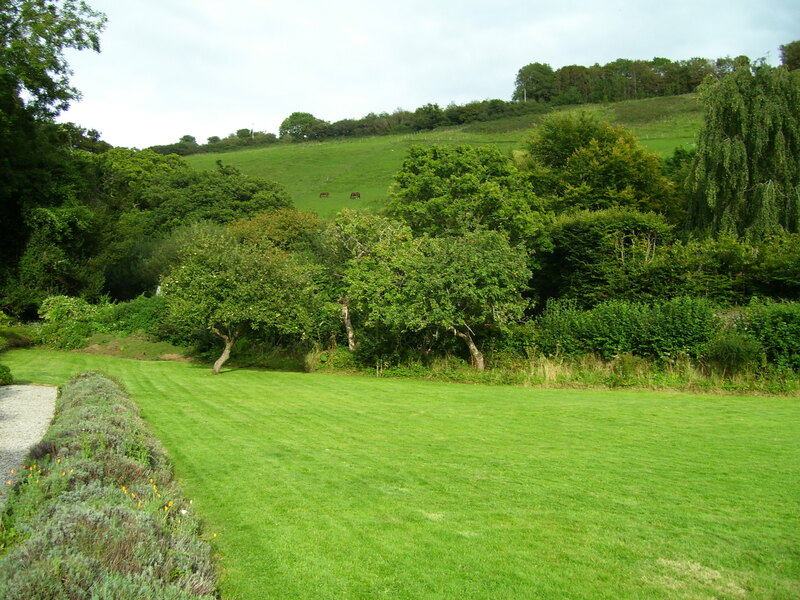 If you want the countryside of England…there is nothing better than right here. 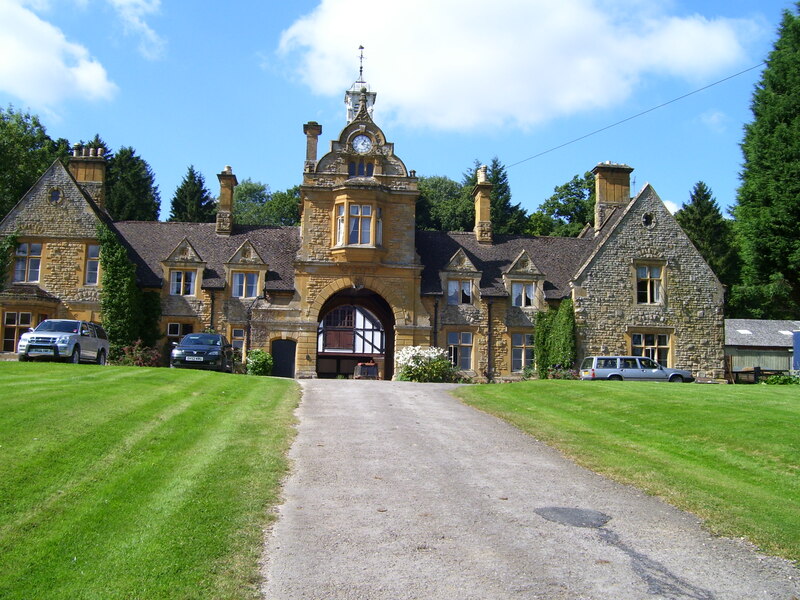 Then back to Sheepscombe House. My god – it’s bloody cold at night! And the sky is dark dark dark – the tiny country villages of course do not have street lamps…but the sky was clear as a bell, and the stars were out in force…walking beneath the overhanging trees up the lane to Sheepscombe was a bit challenging and fun…we actually had to take flashlights with us, because when it gets dark…it gets dark! 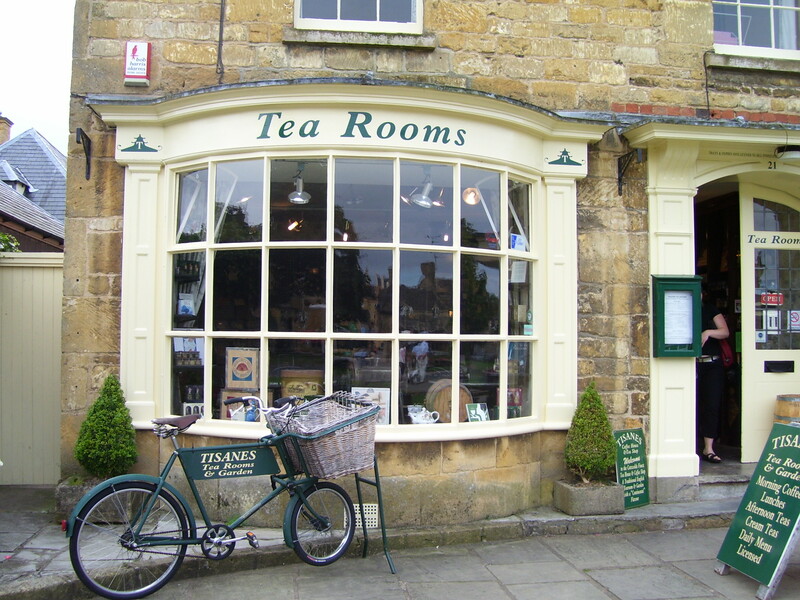 We joined Tim (our host) for a full day’s tour of the Cotswolds, including Stanton, Naunton, the Slaughters, Chipping Camden, Bourton on the Water, etc. A funny moment occurred as Tim was asking Elisa about Bonnie, her dog. “Do you spend much time together?” he asked at one point. It took a moment for us to realize he was actually asking about the three of us! Again, the weather was incredible…blue sky, clear as a bell, 70 degrees – the sun felt absolutely lovely. Tim took us at one point to an organic shopping centre. I have never seen so many beautiful things – from foodstuffs to an elegant dress shop with the most beautiful organic clothes, cashmere, fine wool and cotton – expensive as all get out – the clothes were all white or earthtone grey but beautifully tailored, I just craved something from this shop, but it was out of my reach! – one sweater, the sheerest softest white cashmere, ran about 450 pounds ($1000)…white cashmere blankets…A coat I would have died for was 1300 pounds ($2750) – grey/white tweed…and gorgeous furniture in another shop, more white white white (my favorite color). O to be rich! 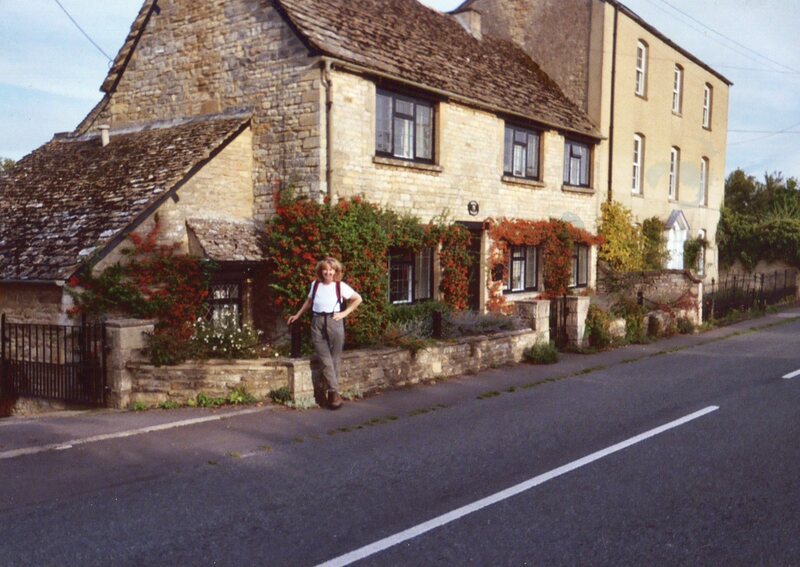 Our tour took us all over the Cotswolds, the small towns were heaven. We also were able to walk through gorgeous manor gardens, and finally got home about 6:30 (85 pounds each of us to Tim). 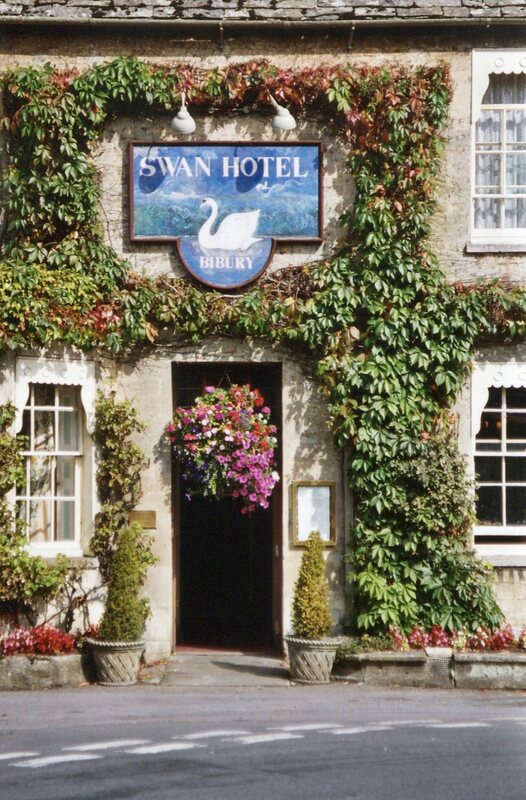 That evening, we ate dinner at The Swan in Broadway – so English, and just a perfect end to the day. 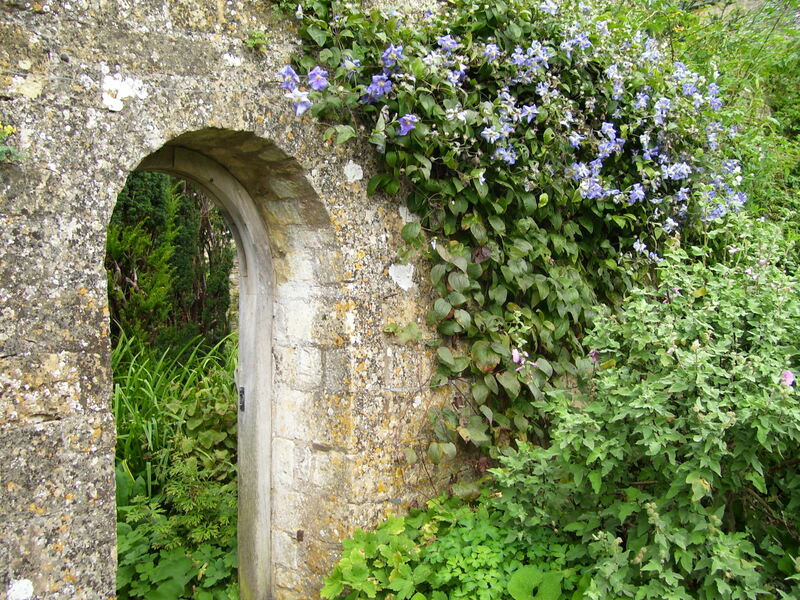 Doorway to the secret garden! Back then to the garage – tire has not even been delivered yet, so we go back to Sheepscombe House, where E&L take naps. 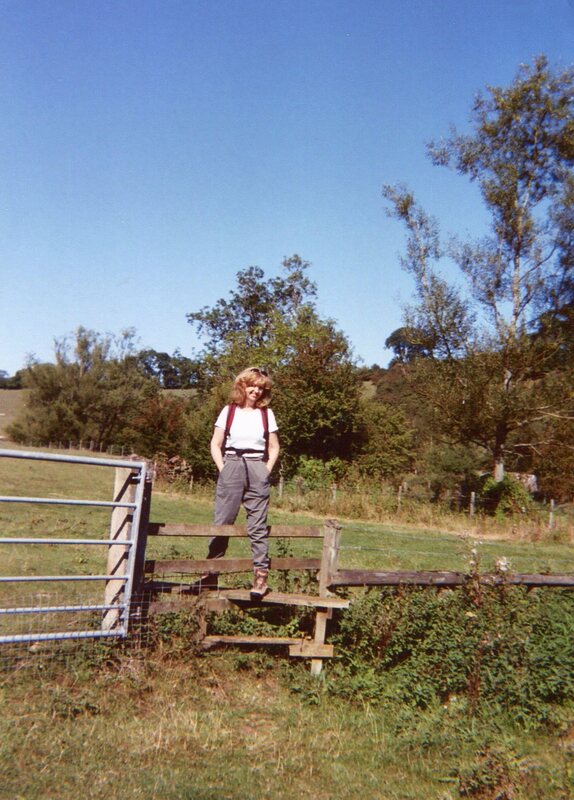 I however left for a couple of hours’ walk through and over fields, meeting a nice man (Bill) and his dog (Gus) – we walked and talked back to his car, and I met and chatted with Daphne, his wife. Lovely couple …then I continued my walk. 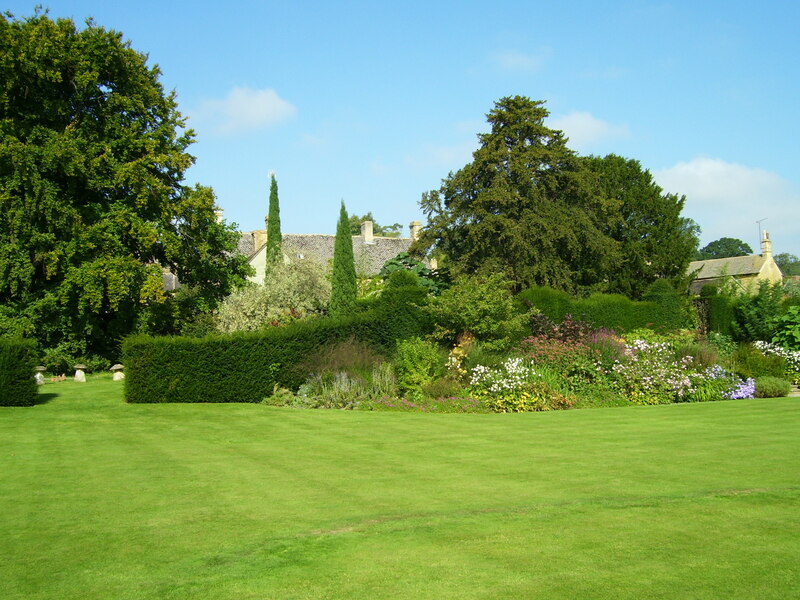 The weather is incredible here in the Cotswolds – cloudy one minute – brilliant sunshine the next. The clouds drifted away and the sun came out in full, the sky once again clean clear blue. This is the best time of day in the Cotswolds…between 4-6PM…everything is golden in the soft sunlight…the fields the greenest, the Cotswolds stone the most golden…the little village of Snowhill lies like a basket of white eggs in a green bowl…incredibly beautiful, surrounded by hill, woods and fields…I could have walked on forever. I meet E&L for dinner at the Snowhill Arms at 7PM– finally, steak and kidney pie. Yum-o again! After dinner, a couple next to us passes over a half bottle of red wine they couldn’t finish – she is from Thailand, he from Virginia. We had a lovely long talk with them…then we are back on the pitch dark Cotswold path to Sheepscombe. Luckily, Jacki has given us the heavy big flashlights to carry and light us home through the narrow high hedgerows! Up around7AM– a cup of tea and a read before breakfast. I see on the news that Pavarotti has died. Another giant gone. Joanna <a friend from Austin visiting relatives in Cirencester> gets here around10AM to meet me for a hike, and we set off for one “round robin” walk around Stanton, Stanway and Snowshill. 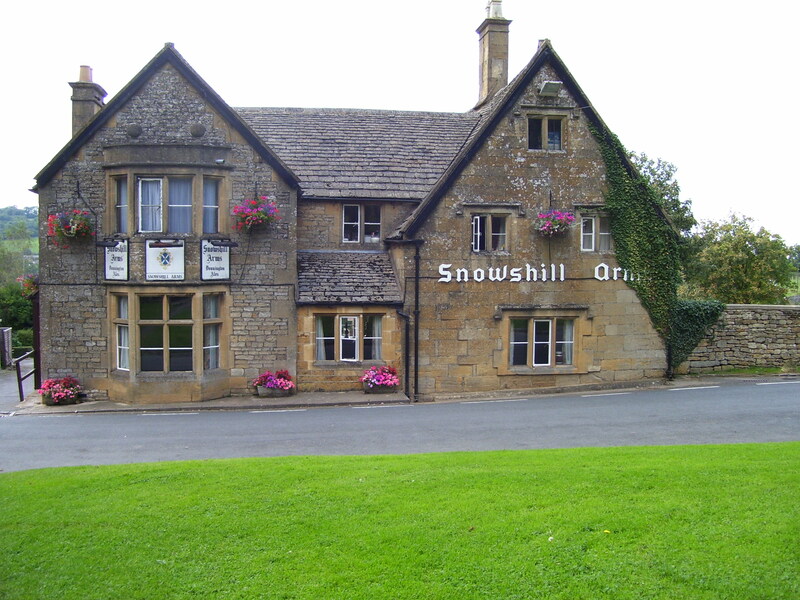 We start at Snowhill instead of Stanton– and of course, somehow end up doing a complete circle of Snowshill! 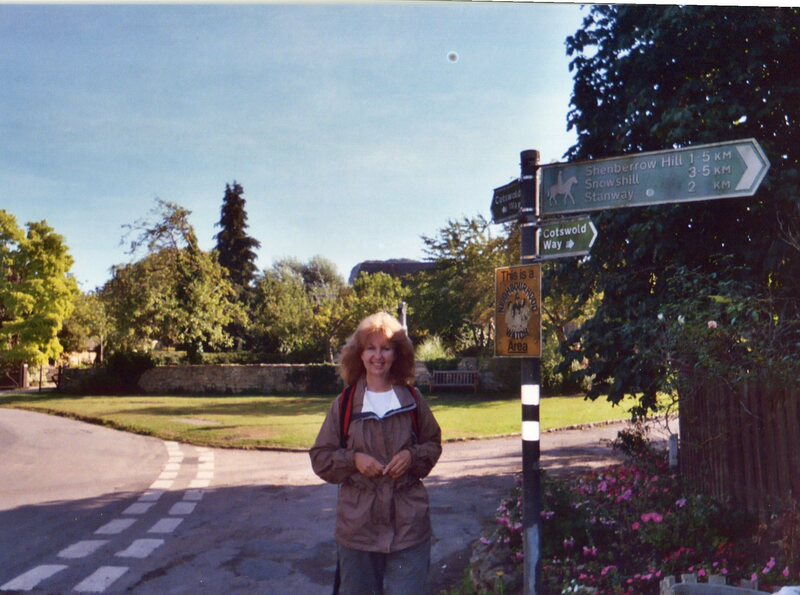 After lunch, we set off for Stanway, walking “The Cotswolds Way”, an historic 100+ mile long footpath, which runs through the heart of the Cotswolds. 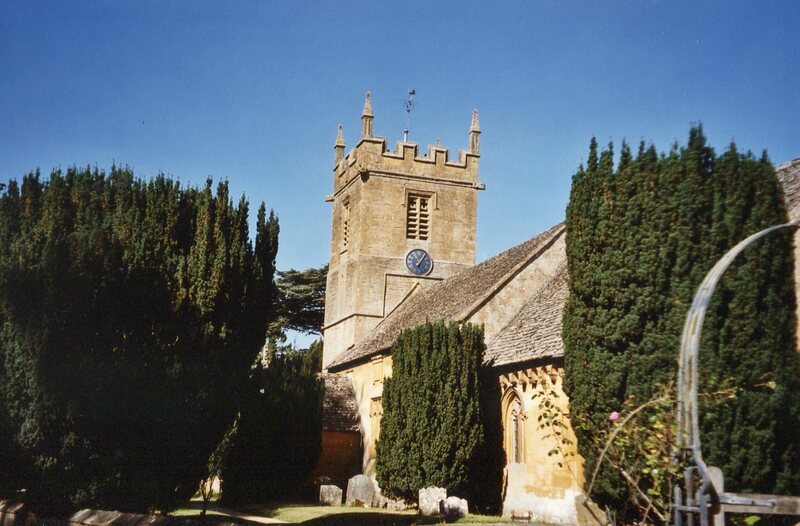 We reach Stanway – another historic and charming small village, without incident. 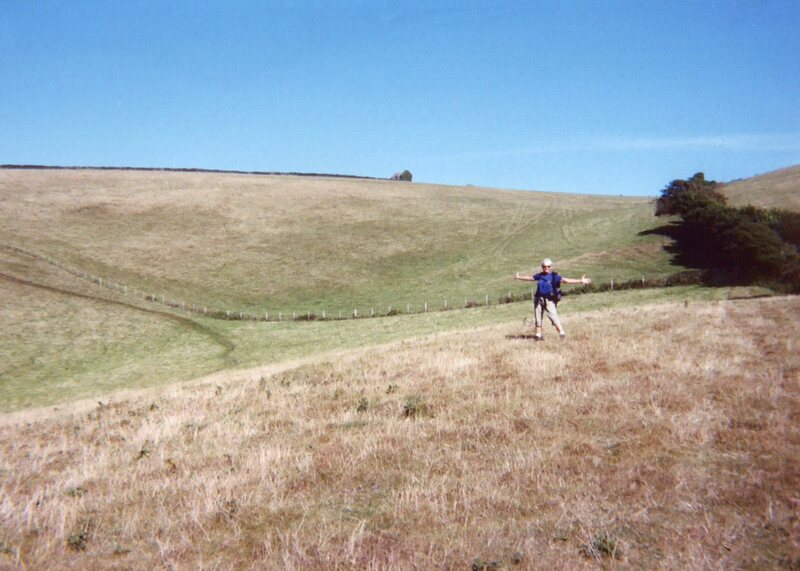 However, once we climb a (majorly) steep hill to where we are supposed to turn towards Snowshill – we wind up getting completely and utterly lost. After wittering around, climbing up and down for an hour, we finally find a promising path which actually leads us back to Stanton! Back in the car for Broadway, finishing at the Horse and Hounds for shandies before saying goodbye. Awoke rather early for me –6:45 AM. I love the cup of tea and the moment of quiet in my room in the early morning. The sun was pouring in through my windows – a gorgeous day – again – awaited us. 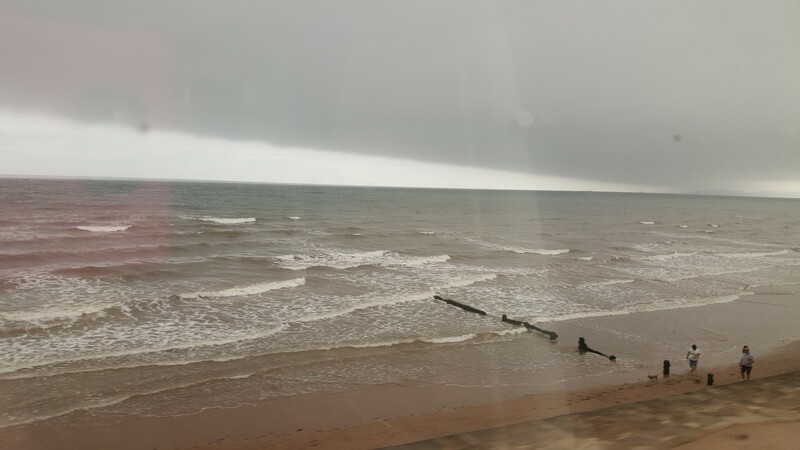 The weather changes here almost hourly – one minute it can be glorious sun – then clouds appear – blow away – then come back – the sky darkens – then again, the sun is out full blast. The most beautiful time of day here has been between 4-6PM. The air is soft, the sun shines but not as intensely, and the sky completely clears. All is bathed in the soft golden sunlight, and Jane Austen’s ghost hovers nearby. 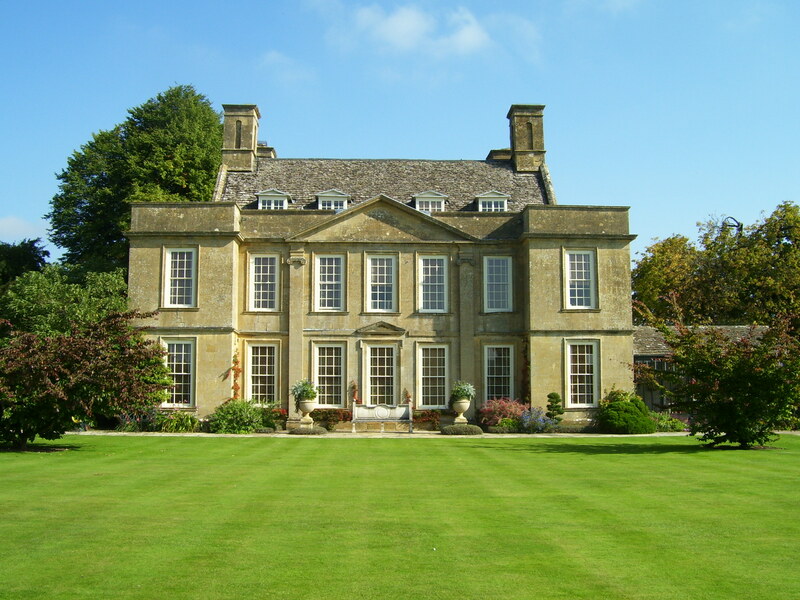 Today we drove to Morton on the Marsh after breakfast and – quite by accident – parked across from a stunning house called Bourton Manor. The gardens were open to the public – the prettiest I have seen yet – manicured lawns, massed flower borders, topiaries, mazes, finials, stonework, espaliers with various beautiful climbing vines and flowers – roses abounded, highly scented – there is a “white garden” with stocks, roses, daisies – I loved this garden, and the house is an architectural gem. From there, on to the Falconry down the road to watch a peregrine falcon display, and then on to the nearby Arboretum. 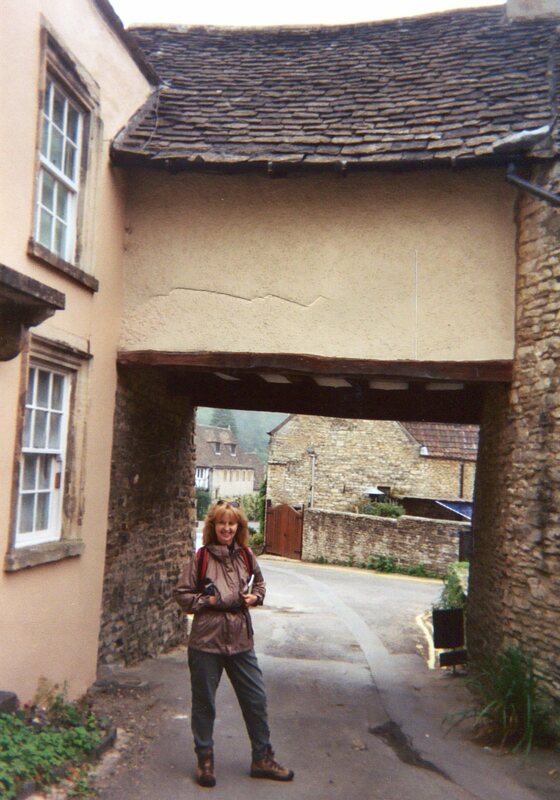 After this, we drove to Burford, a pretty (and not so small) market town, with lovely shops along a winding hilly main street. 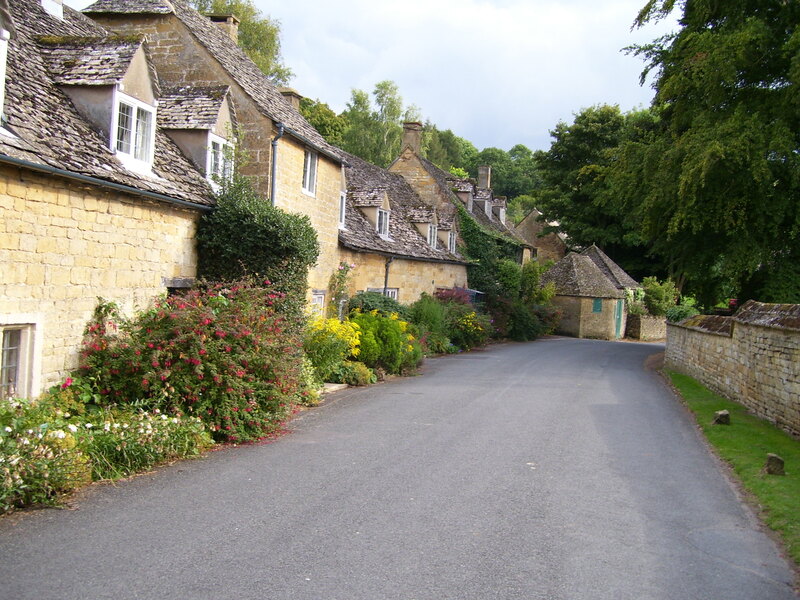 Snowshill – could anything be prettier? 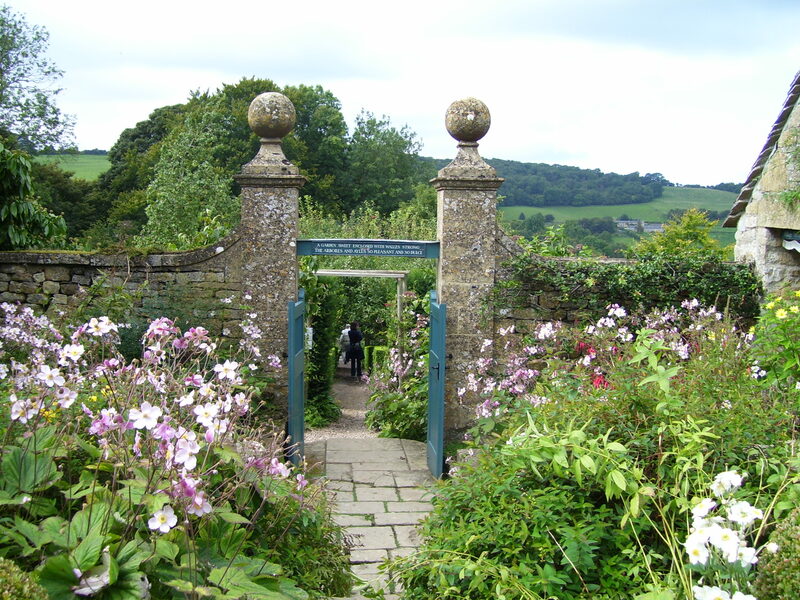 When we arrived back at Sheepscombe House, it was 5PM– I went for an hour’s walk again up around fields and hills, discovering that exquisite view of Snowshill…I think one of the most beautiful in England. Another lovely day. Tomorrow, we leave for London! 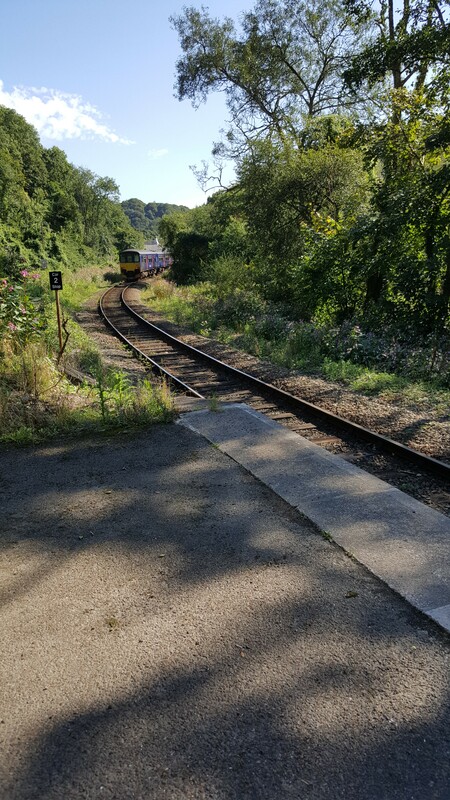 And thus ended the latest English sabbatical…I couldn’t have asked for better weather, better countryside, better food…just more hikes! But it was great. Now I know why I keep going back…and back…and…. 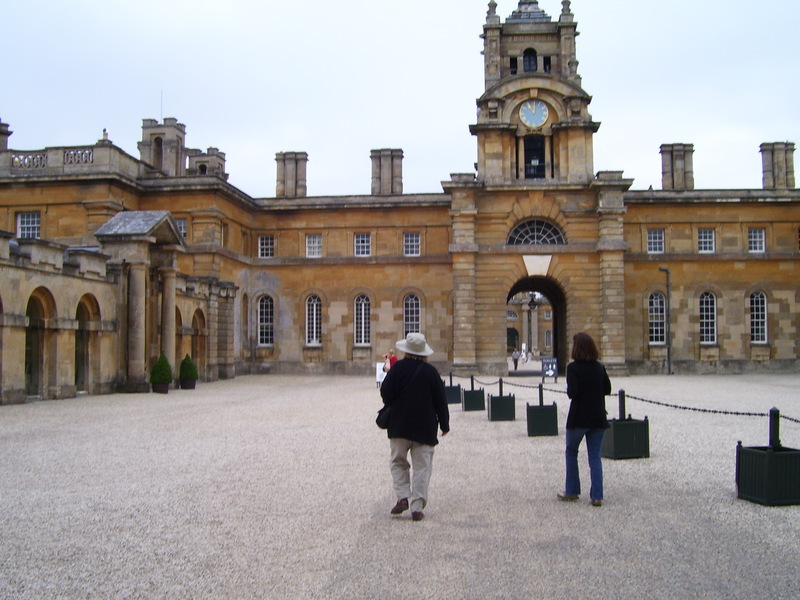 Posted in Uncategorized and tagged Blenheim Palace, Bourton Manor, Bourton on Marsh, Bridget Jones, Bristol, Broadway, Broadway Tower, carpe diem, carpe diem rosemary, Cornwall, Cotswolds, Cotswolds Way, England, England's green and pleasant land, English footpaths, Evesham, Fowey, Hiking through England's Green and Pleasant Land, Looe, Lost Gardens of Heligan, Polperro, Polraen House, Polruan, Sheepscombe, Snowshill, Snowshill Arms pub, St Mawes, Stanton, Stanway, Truro, Windsor. Bookmark the permalink. 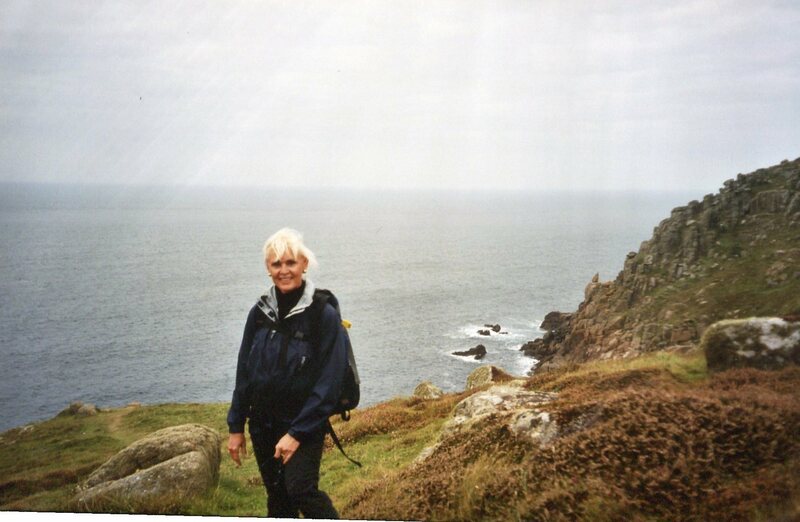 I’ve wanted to hike over England’s cliffs and fields for years – full days of hiking (but ending up in a bed with a bathroom – no camping for me!) in some of the most beautiful countryside on the face of the earth. 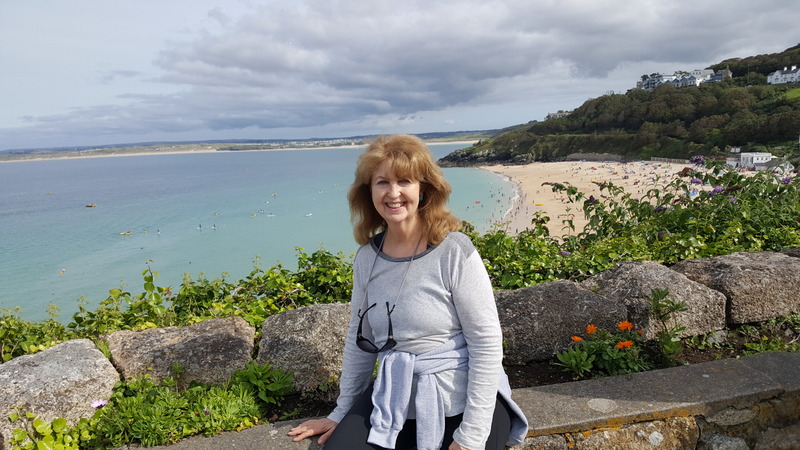 I was lucky to find a friend who also wanted to spend time hiking the back roads and cliffs of Cornwall (which I had visited before) as well as revisit the Cotswolds. 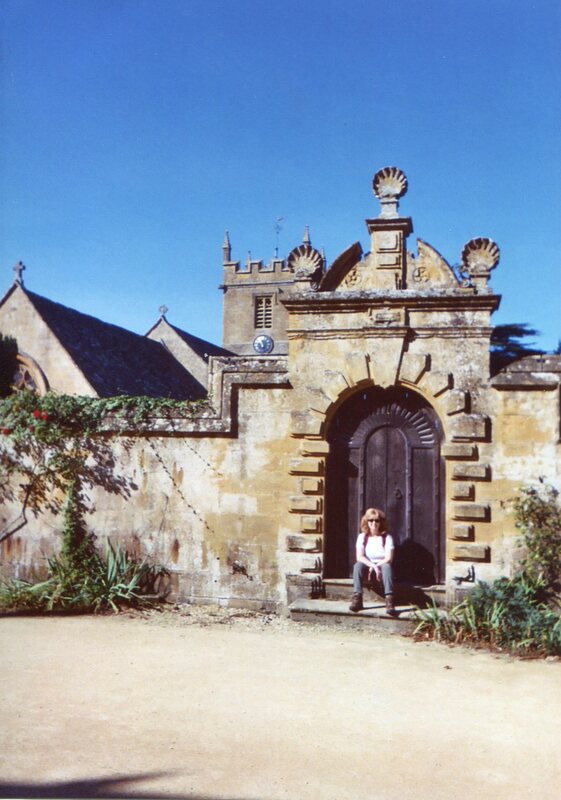 I had never been to the Cotswolds and Diane knew it well. So off we set…. Back at Lowerfield Farm, we found our hosts had turned on the central heat – just for us (primarily me, being a cold-blooded type). 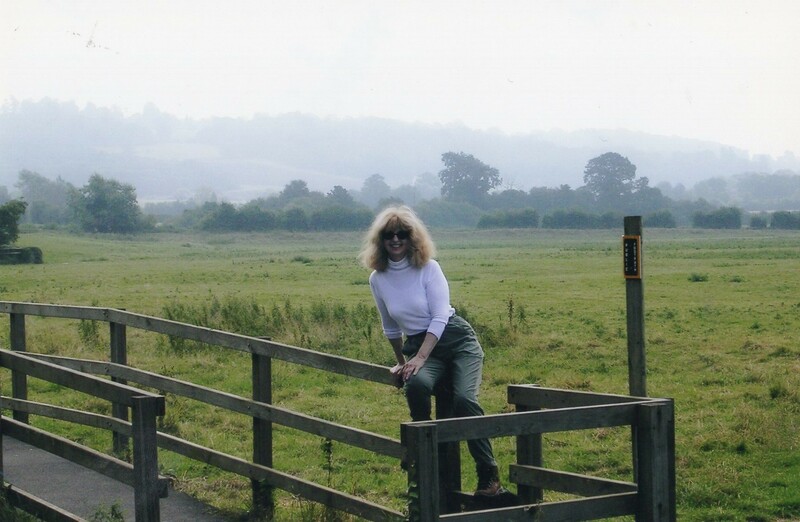 Diane planned out our Cotswold Walks – and we were once again in our beds, all warm and cosy for the night with the green fields of the Cotswolds and a profound country silence surrounding us. Note: We had an explosive toilet…. Up at 7:30, we prepared for breakfast at 8:30: Muesli, cream, coffee, pears from the garden, yoghurt and hot chocolate! Thank the lord we were hiking! As we were in the middle of breakfast, a hunt came through: we saw the masters of the hunt in their brilliant red coats, and the rest dressed in hunting green, with about 20 hounds sprawling across the front lawn. The horses were beautiful! Our next-table neighbors were three delightful ladies, who bussed in from another Cotswolds town for a few days’ vacation. They told us they spent the night baking in their rooms – someone had turned on the heat! We kept silent. After breakfast we drove to Bibury to begin our first hike – Bibury is a beautiful little Cotswolds village with a river running through it. I was so nervous about driving on the left hand side, not to mention fielding the roundabouts. 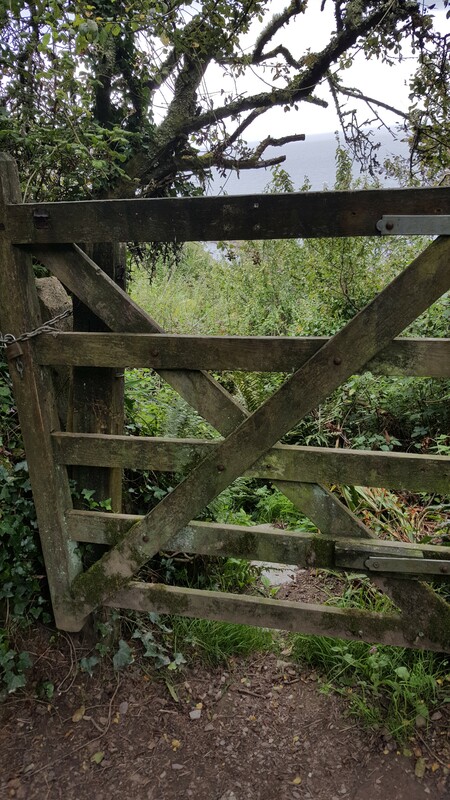 But we made it to the parking lot, and began our 6 mile walk through completely entrancing countryside – small woods, rolling hills, tiny streams. The weather was incredible: blue skies, sunshine, warm – we started off in jackets, ended up in t-shirts. This walk took about 2-l/2 hours. It took us back into Bibury by a different footpath, where we had lunch at The Swan Hotel, an historic old ivy-covered hotel overlooking the river. Diane had carrot soup, I had chicken tikka and chips! After this repaste, we drove to Burford to begin our second hike, which took about three hours. All told, we hiked about twelve miles today – nice! 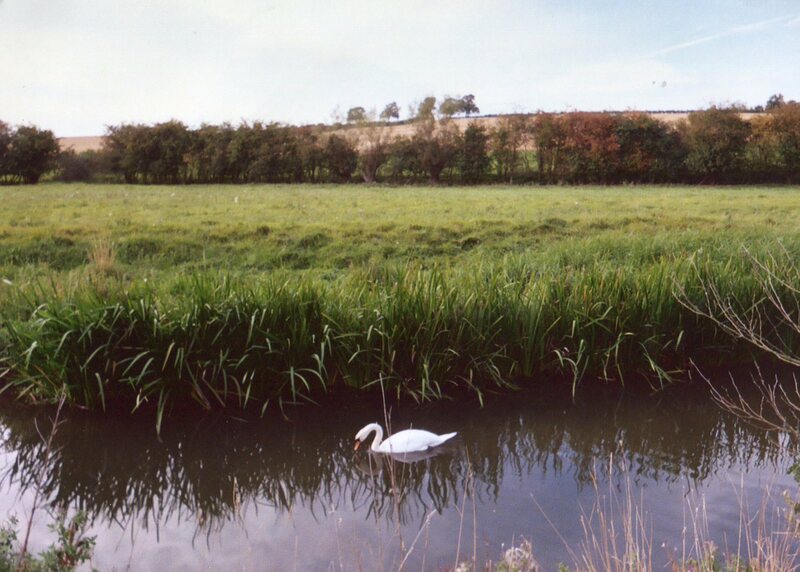 This particular hike was through fields of wheat cut for the winter – the imagery was gorgeous…then it’s back roads, and copses, til we reached a narrow river called the Windrush, where we saw enchanting white swans. It was dark by this time, so back to Lowerfield Farm. 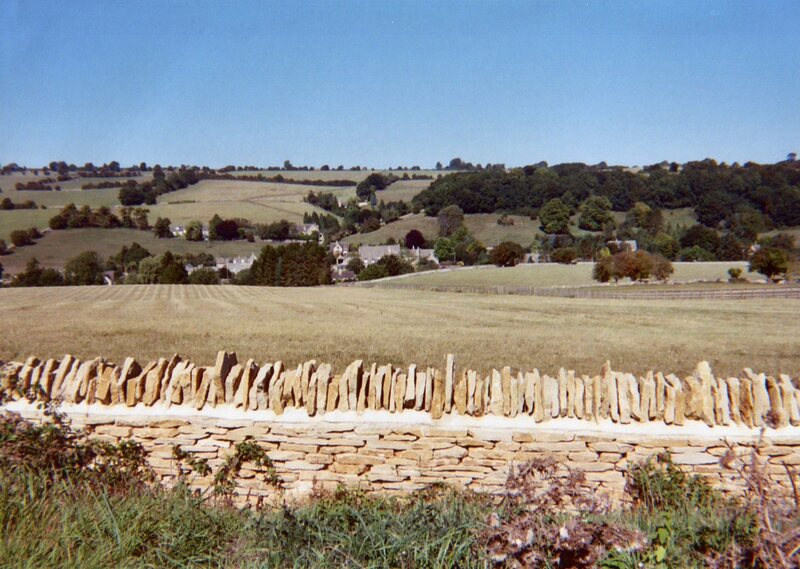 The Cotswolds are beautiful, beautiful. 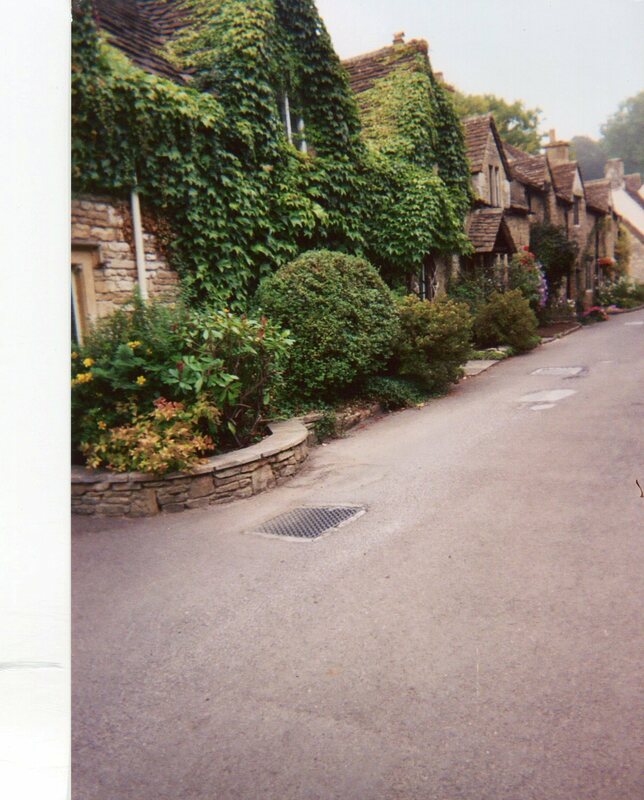 I love Broadway and Bibury – small and lovely iconic English villages. But I felt really tired — stress and jet lag catching up with me! We were up at 7:30 as usual, and had a big breakfast: Muesli, egg and bacon, coffee. Then it’s on the road for a short drive to Stanton, which is (yet another) charming little village. First a word about the weather: it continued to astonish us how incredibly gorgeous it was. The skies had drifts of a few white clouds but the sun was shining madly, and it was 80 degrees. Everyone we met was delighted with the continuous sunshine. It was so refreshing; keeping it “hikeable” was a lovely crisp breeze. At night, the sky was clear as a bell, and the moon a harvest moon, immense and golden in the black Cotswolds sky. 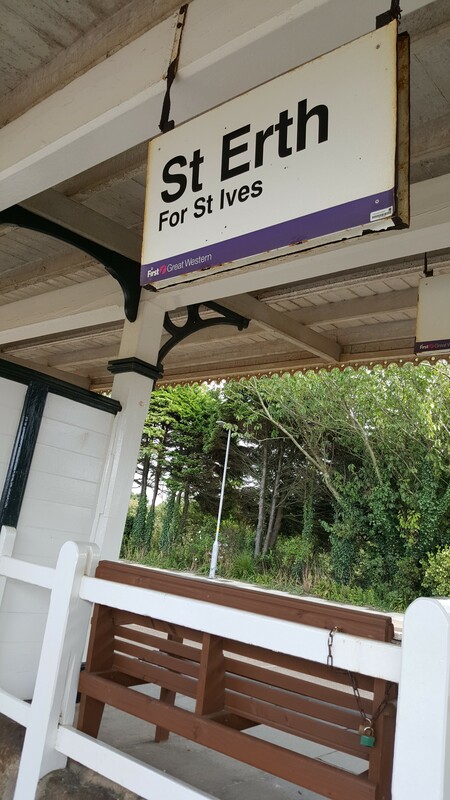 Anyway: we drove to Stanton and parked the car, preparatory for our hike from Stanton to Stanway, Snowshill, Buckland, inadvertently through Laverton and then back to Stanton. I thought Broadway delightful, but for me, these towns are the real thing! What a lovely, lovely hike. We started before 10AM, and finished around 4PM. 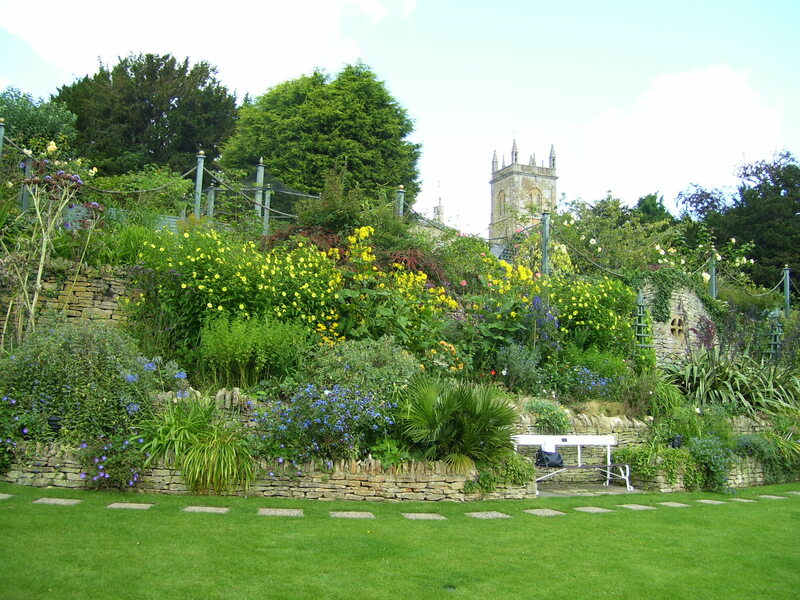 Stanton is a completely charming town, and Laverton is absolutely gorgeous: Cotswolds cottages built of the sunny Cotswold stone, beautiful gardens, surrounded by the rolling hills and farmlands of the country. On the first leg of our hike, we met a group of about twenty men and women, approximately our ages, led by a local guide. She said the men loved to talk to us “young sprigs” and we appreciated the sentiment! This is the leg of the hike that led up the steepest hill for about 30 minutes, and left me breathing hard (it wasn’t that high – I’m such a wuss). 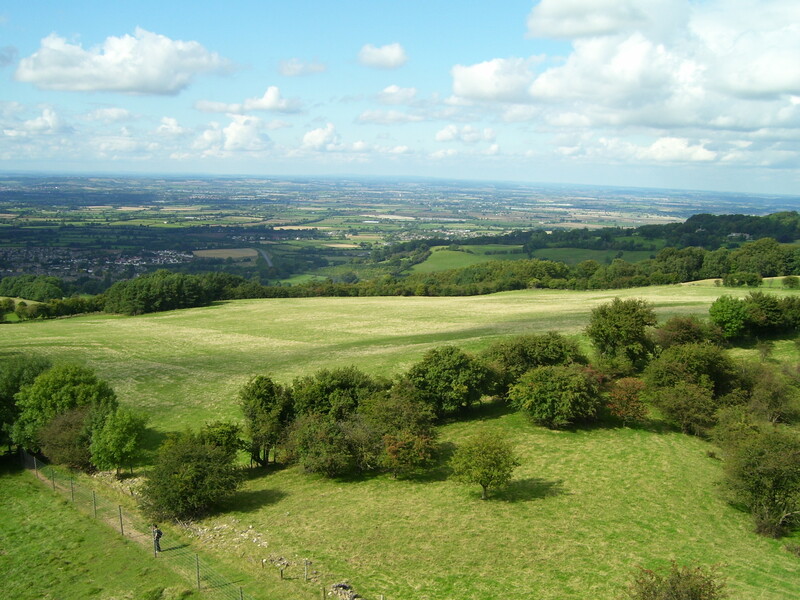 When we arrived at the top, the whole of the Cotswolds lay before us. Pictures I have seen cannot begin to describe the beauty. 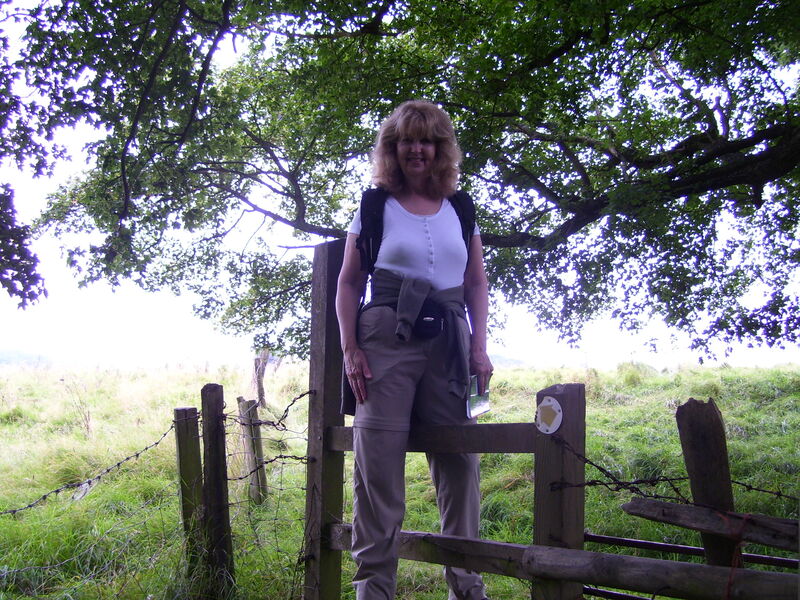 We then hiked along a part of the Cotswolds Way, through fields, woods, over many stiles and through many gates. 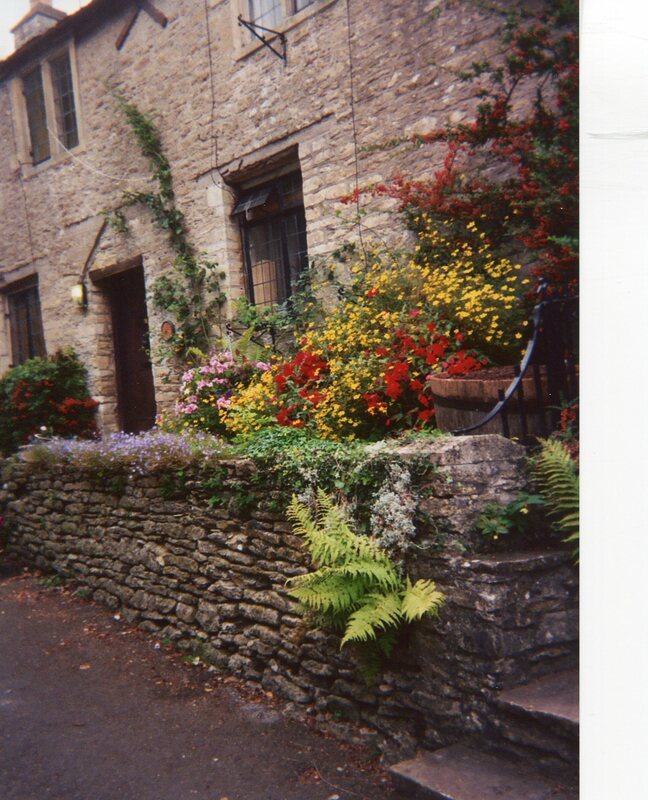 We walked through the enchanting village of Snowshill (in which I will actually stay a few years later) -a Cotswolds gem of a village, tiny and seemingly untouched by tourism: lovely architecture, picturesque homes dripping with flowers and beautifully and personally landscaped. 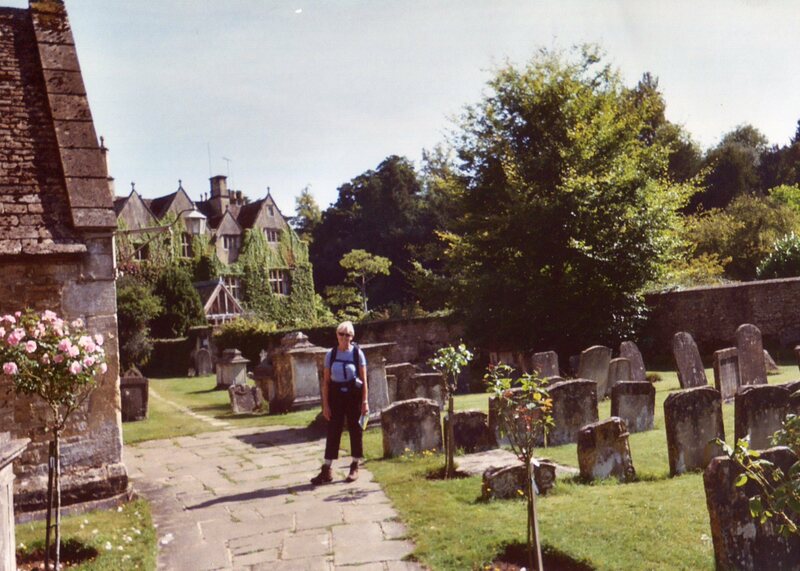 Our companions left us in Snowshill, where they stopped to picnic in the old church graveyard, while Diane and I had a pub lunch – ploughman’s (cheese, bread, pickles). The sun continued to shine as we continued over hill and dale. We came to Stanton’s church spire, wound back through a farm, and found our car parked at the Cricket Club, where a match was taking place. Fun to watch, incomprehensible to figure out! But so nice to see those cricket whites once again. 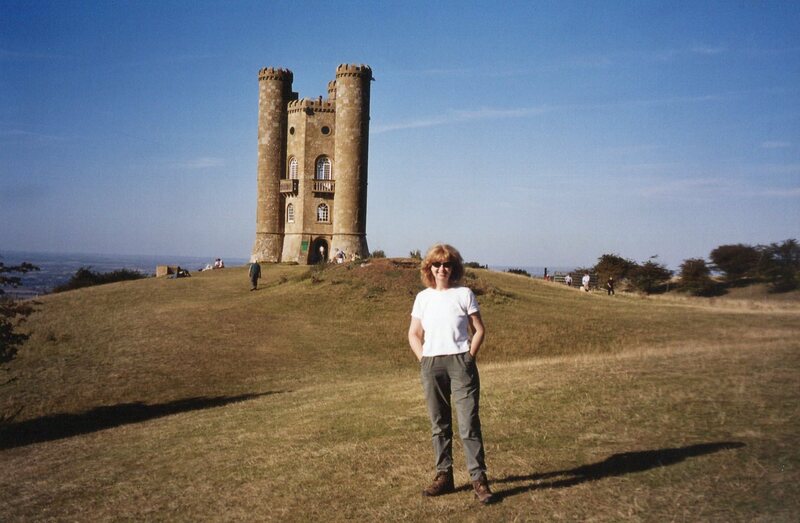 Back in the car, Diane drove to the Broadway Folly, situated atop a hill, from which we got an astounding view 360 degrees of the Cotswolds. Fabulous! Then it was back to our B&B, where we freshened up and drove to Chipping Camden for dinner and a quick walk down the main street. Great conversation at dinner, despite the fact that Diane is a Republican and I a Democrat! Then it was back to Lowerfield Farm, and so to bed. We were definitely hoping for more of this supremely gorgeous weather tomorrow, as this would be our longest hike. 7:30 and we’re down to breakfast (the usual fabulous feast) and by 9-ish, we were on the road for Bourton-on-the-Water, where we began our hike (about ten miles round trip, longer with side trips). 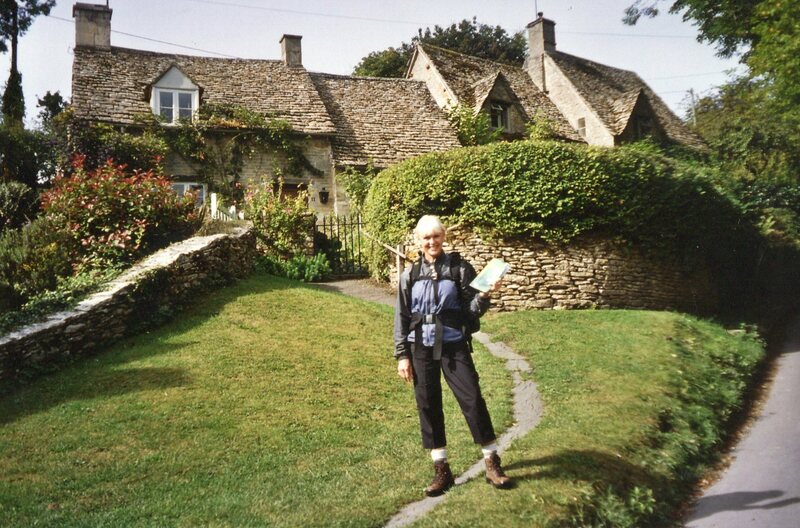 We hiked through prosperous-looking farms, over farmland, through woods, besides rivers and streams – through Lower Slaughter. A picnic lunch of crusty rolls, cheese and tomatoes in a field far from anywhere was a nice break. 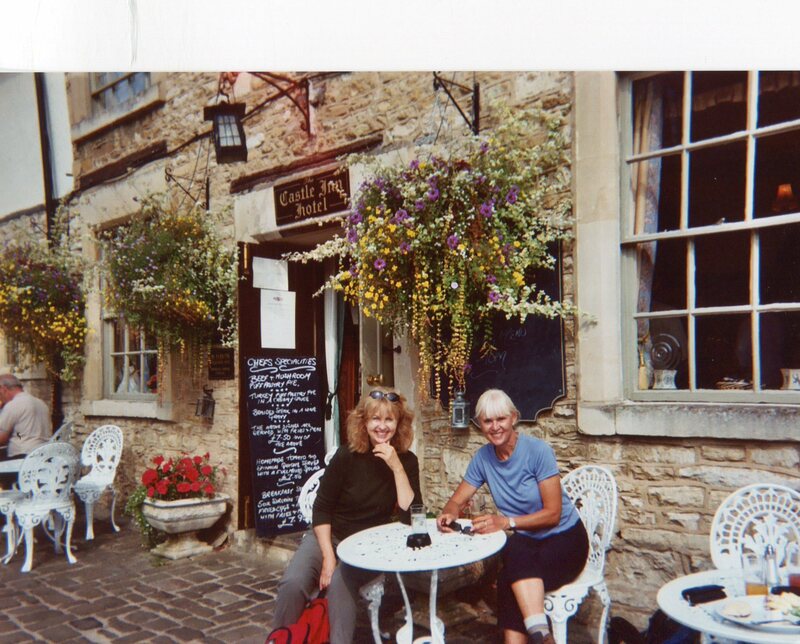 Then it was on to Upper Slaughter where we stopped in a pub for a drink – fabulous, incredible 80 degree weather. Sky clear as glass. 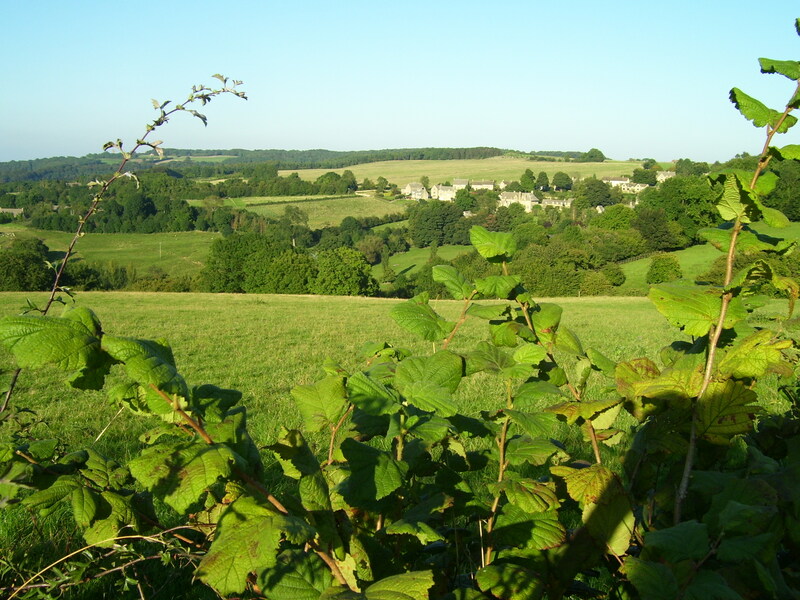 Then on to Naunton, across grassy ridges, through more woods and fields and eventually back to Bourton-on-the-Water. The day was supremely beautiful. Why I even bothered carrying a rain jacket in my backpack I don’t know. I was actually tanning! My arms were brown as a berry. Not that many people are out and about, surprisingly. We saw a few – a very few – on the trail, and they were all very pleasant. 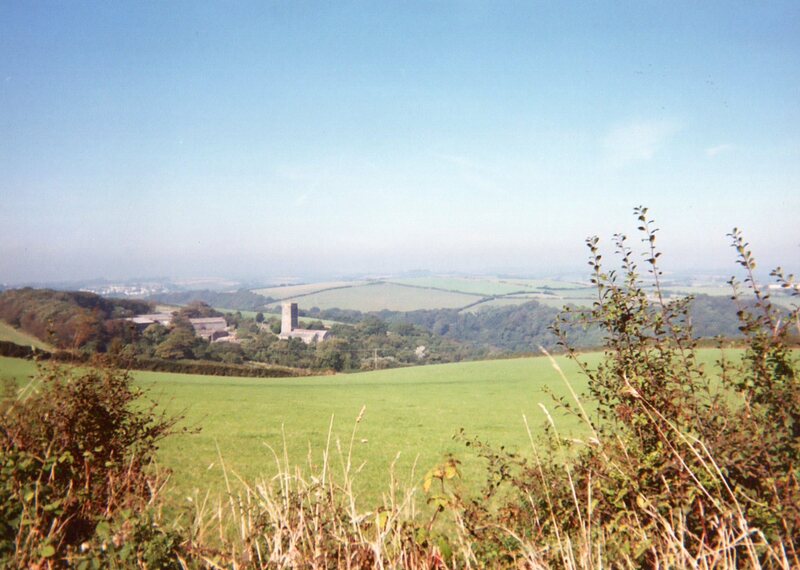 We left Lowerfield Farm (sob) and drove to the M-5, all the way to Liskeard (I was driving.) We stopped off in Chudleigh for lunch, where Diane took over. 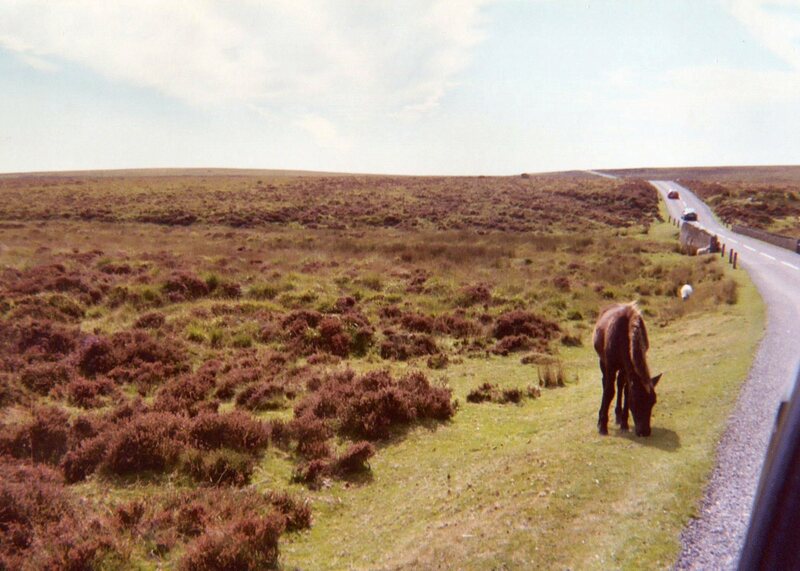 From there, it was on to Dartmoor National Park. I loved it!! So wild and desolate and full of sheep and wild ponies. Beautiful. You could imagine Heathcliff and Cathy running across the heather. The sun shone all day long. 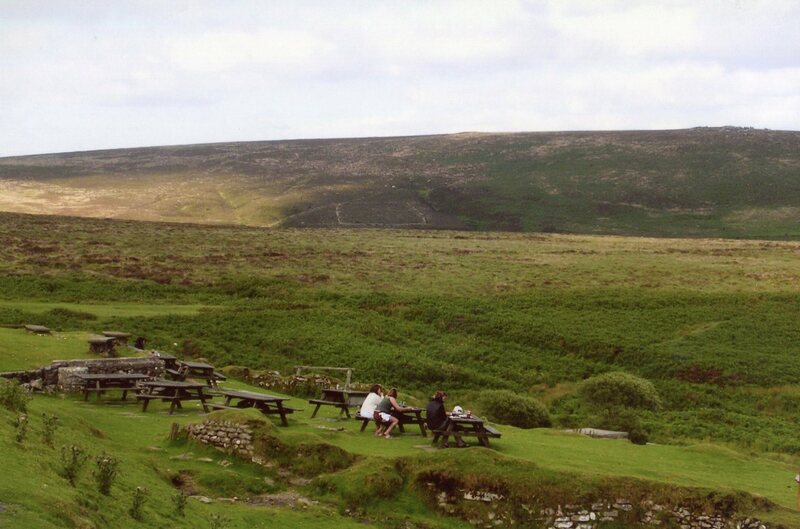 At the top of the world in the middle of nowhere on a road through Dartmoor stands the Warren Hill Inn. 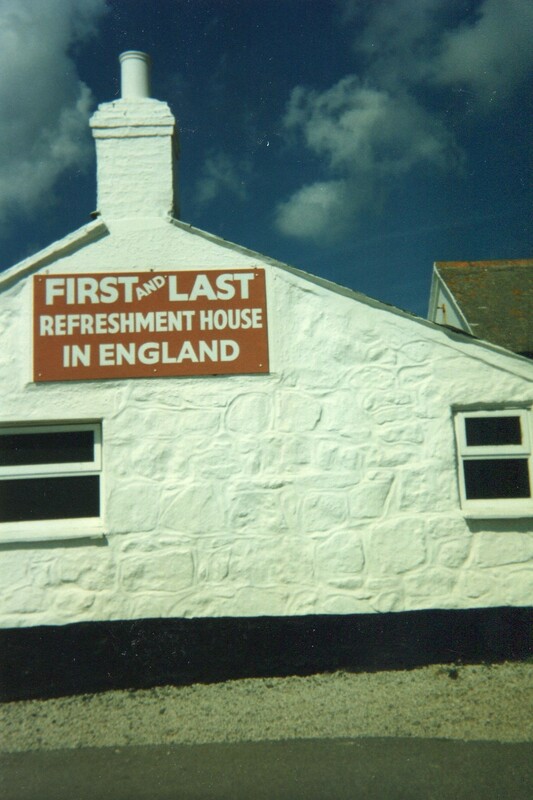 Here we stopped for a drink. 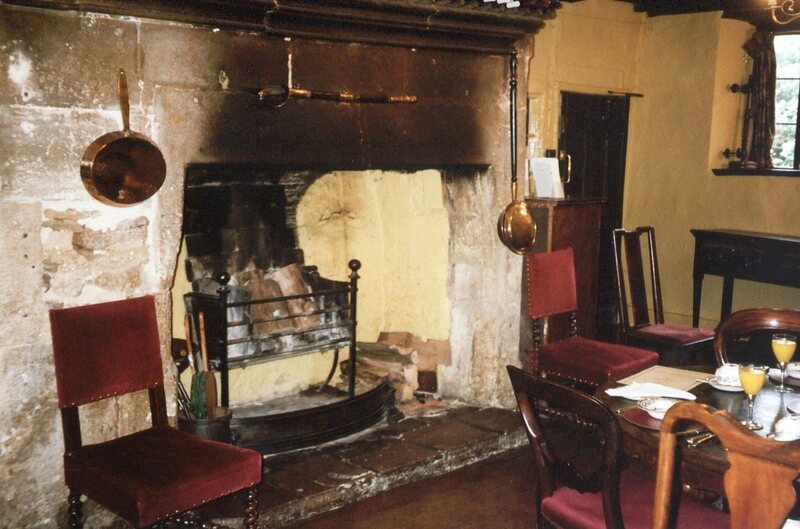 It was a little cool out on the moors, so a wood fire was burning in the fireplace, and it was a true old-timey pub atmosphere, deep and dark. We chatted for a while with a man from Bath (incredibly crusty accent) who was looking at properties to buy for leasing to visitors. He was extremely friendly – took our pictures without a murmur. From Warren Hill, we drove down narrow, then narrower, then even narrower lanes with high hedgerows. Through tiny villages and hamlets we drove and through some of the loveliest countryside (Dorset) which is every bit as delightful as the Cotswolds. We drove all the way to Looe, and then found Allhays on Talland Bay. Allhays was a very lovely B&B off the beaten path <and I am very sorry to say it has since closed>. 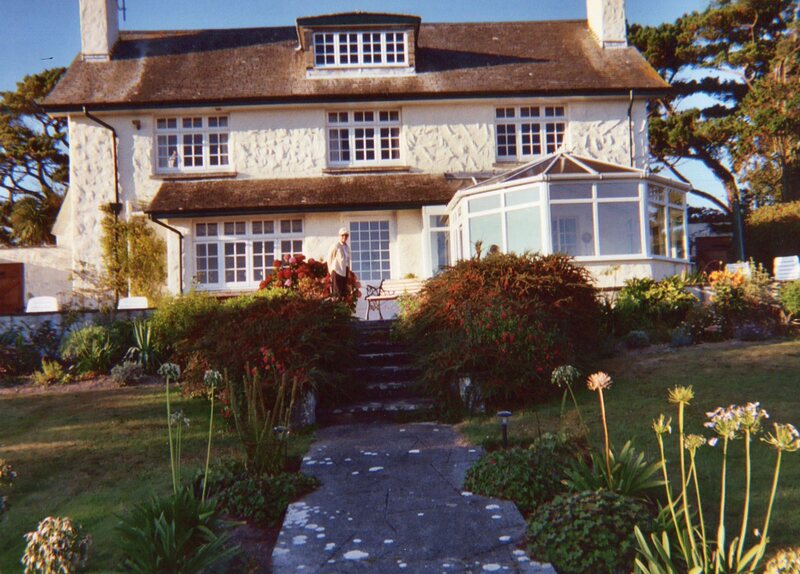 Situated on Talland Bay, between Looe and Polperro, its cream-colored stone glowed in the late afternoon light, and its bushes were heavy with hydrangeas surrounding it. The interior living room (for guests) had two lovely cream colored, soft chenille sofas, and the whole house had the French touch, with patterned draperies, beautiful pictures, and the woodwork painted in heavy high gloss cream. The carpet was cream bordering on ecru up the stairs. Annie, (one of our hosts, and French), had placed a fresh yellow rose in our lovely bedroom on the second story. The bedroom overlooked the lawn in back which led to the view of the cliffs and then the sparkling sea. Our bathroom was the size of a pea. When we were ready for dinner, Diane could not find the car keys. After frantically checking the car and the trail back to our room, and looking under the bed, in her backpack and various pockets, they turned up in her purse. And so it goes…. We were up around 7:30 and had a traditional, and delicious, English breakfast in Allhays’ sunlit breakfast room. 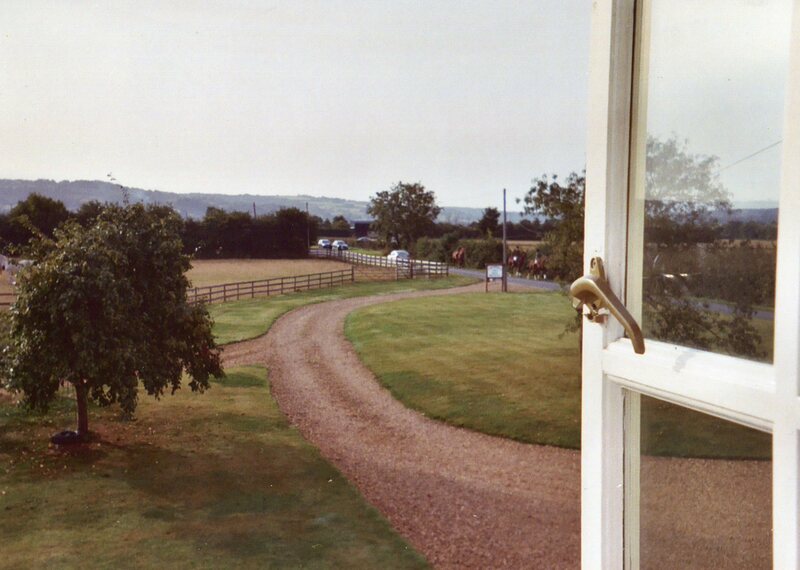 The room was nothing but windows which looked out onto the back “garden” and all the way over the cliffs to the sea. Incredible views. Breakfast included muesli, yoghurt, homemade bread and jams, etc. Mowgli joined us for breakfast. He wanted to join us in the bedroom last night, but as Diane said “it’s the cat or me!” I had to opt for sharing the room with her! Mowgli was a beautifully marked sealpoint Siamese, sleek as a whistle, and very loving. I didn’t want to put her out (especially as I love her name), but she seemed to settle down on the landing. This morning we set off on our hike to Polperro (two miles coastal). 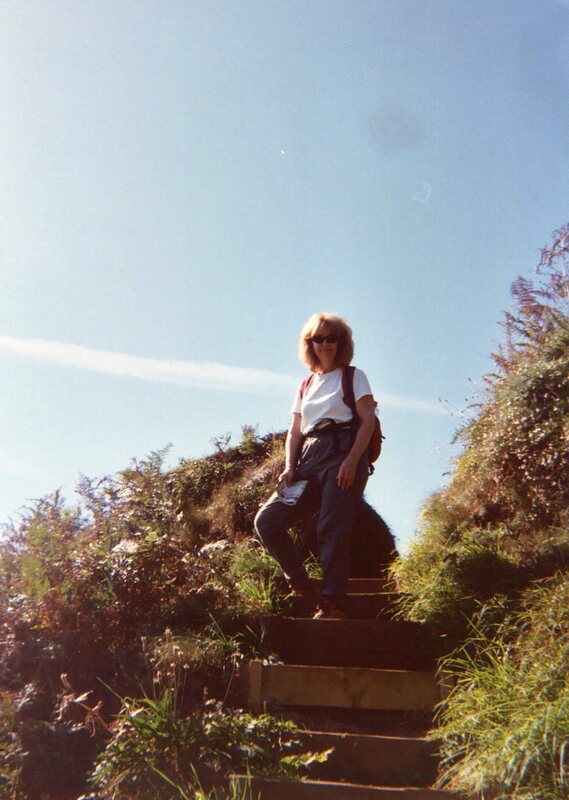 A fabulous walk – all downhill – along coastal beauty that is almost ethereal. We reached Polperro, and stocked up for lunch. Me: Cornish pasty, crusty roll (still uneaten), and a tomato. I had a banana in my backpack. Diane had grapes and a raisin scone. 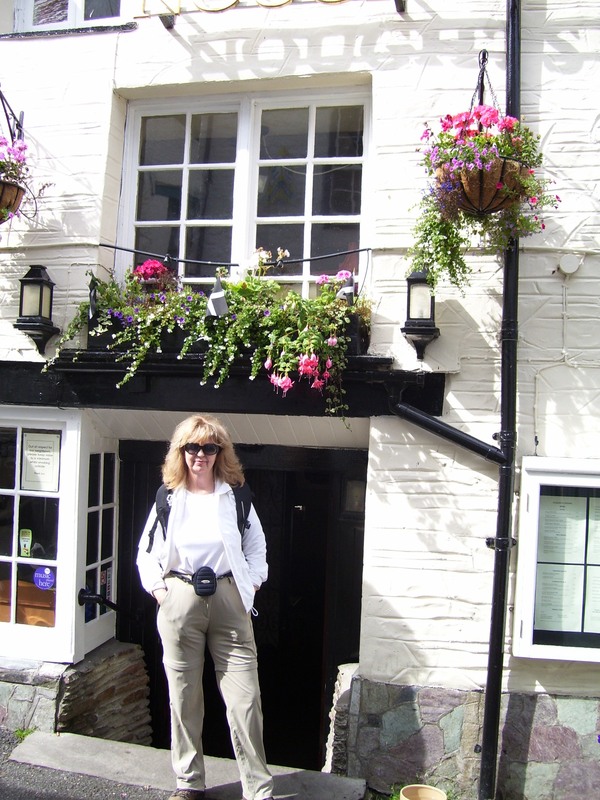 We wandered around Polperro, and I found the Noughts and Crosses Inn – still there after all these years! Jean and Toni (good friends of mine in Houston) honeymooned at this inn 60 years ago. We rambled around and window shopped, taking pictures of the harbor, the sun shining brightly on this attractive little fishing village. 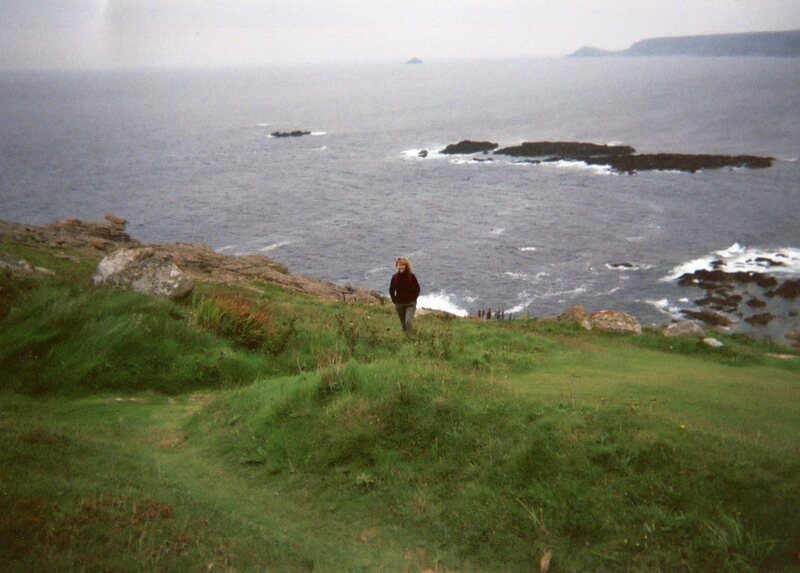 Then we were off on our challenging cliff walk from Polperro, round the point, then up and over the fields. The sun was intense, and the sky was clear and deep blue, while the water seen down below was silver blue. Fairy tale. We walked and walked and WALKED – mostly uphill – stairs and more stairs – up and up and UP! 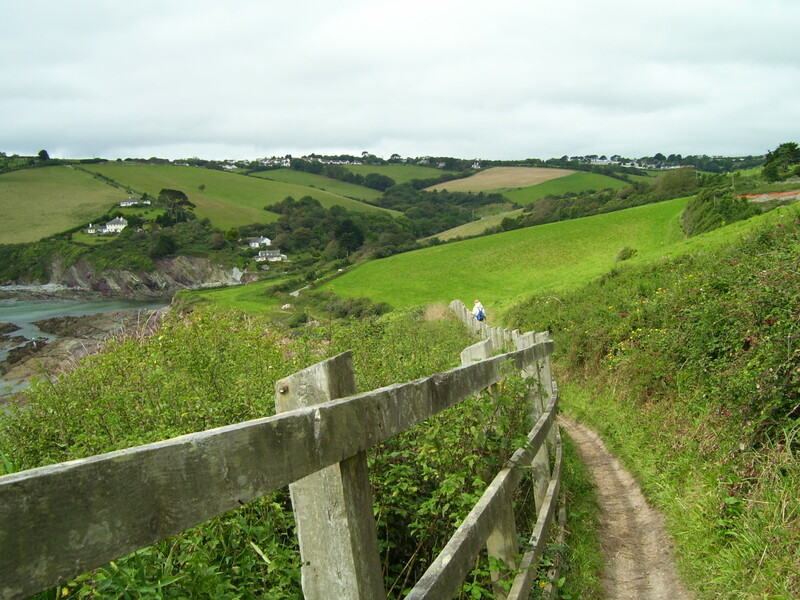 And then across fields, again uphill, past a deserted barn into a narrow lane, and then on the downhill road to Polperro. We had been walking since 10AM, and it was now 3 o’clock. I LOVED it. Back in Polperro, we stopped for a lemonade (why does the lemonade taste so much better here than at home?) 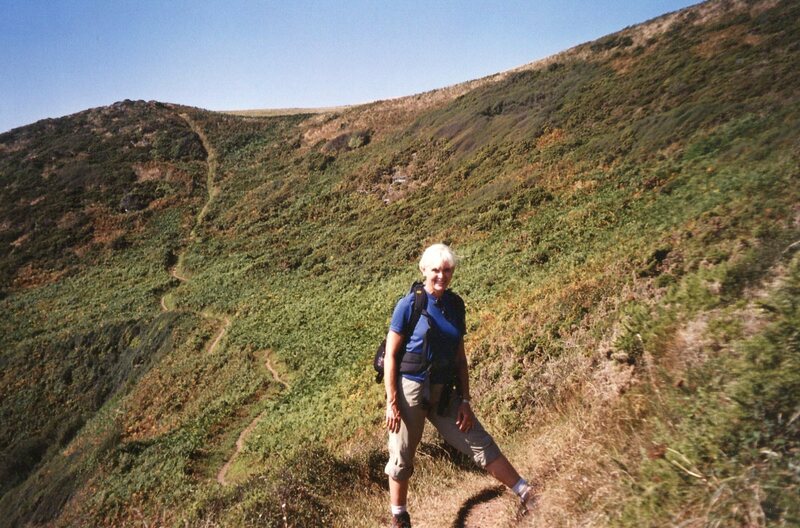 and still had two miles left to go back to Allhays – all uphill and over the cliffs. 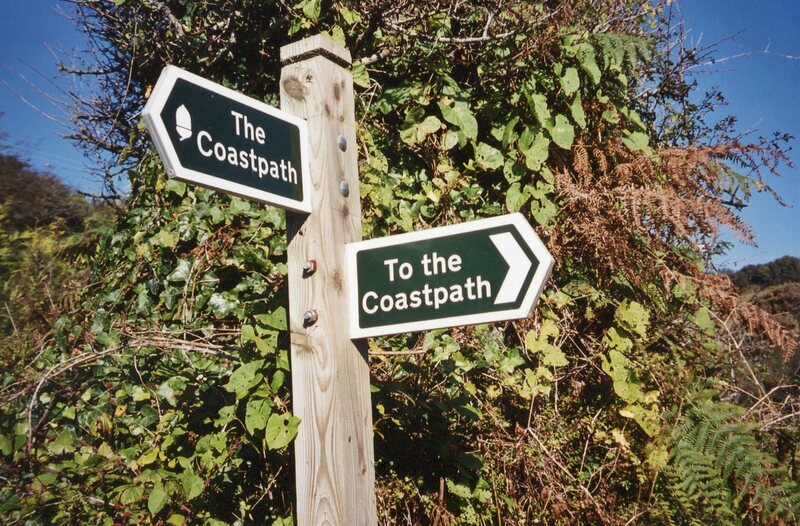 The coast road back to Allhays is often a narrow lane banked by hedges of brambles, blackberries and ferns. All along the coast these hedges were alive with butterflies, fluttering everywhere, and the hum of the bees. We finally reached Allhays in time for a shower and then it was out to dinner. Our dinner lasted three hours – we talked non-stop. Then it was back to Allhays down the dark high hedge-lined lanes. We figure we’ve clocked in about 45-50 miles to date. Woke up at 7:30 to another glorious day. The view from our bedroom window was stunning. Off we go after our muesli, yoghurt, granary bread (home baked), and Scotch pancakes, to drive to Fowey/Bodinnick, drop off the car and begin a hike around the coast (which is projected to take about three hours.) The cliff walk was not as challenging as yesterday’s, but it was just as beautiful, and a little cooler, although the sun continued to shine shine shine. We walked narrow cliff paths rimmed with blackberry bushes, ferns and brambles; deep lanes lined high with hedgerows; past ancient churches; over fields and streams – the silver sea looked like a mirage –incredibly clear, incredibly beautiful under the sun, and stretching to the far blue horizon. 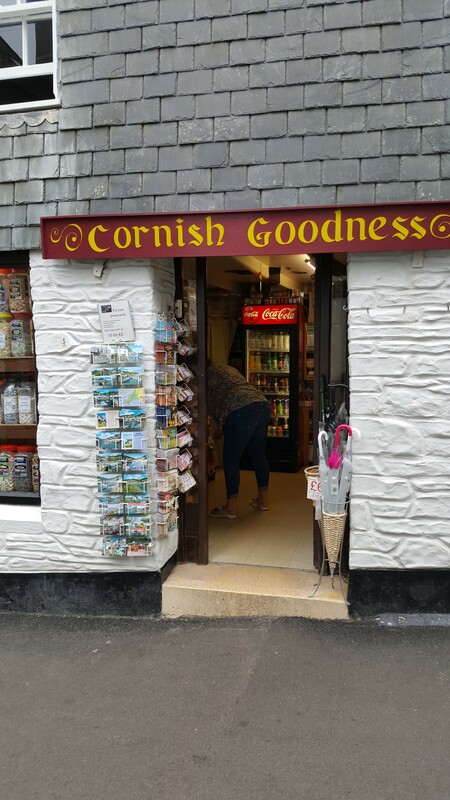 We had eaten a good breakfast, and weren’t hungry, until we came back around through Polruan, where we stopped for a quick bite. 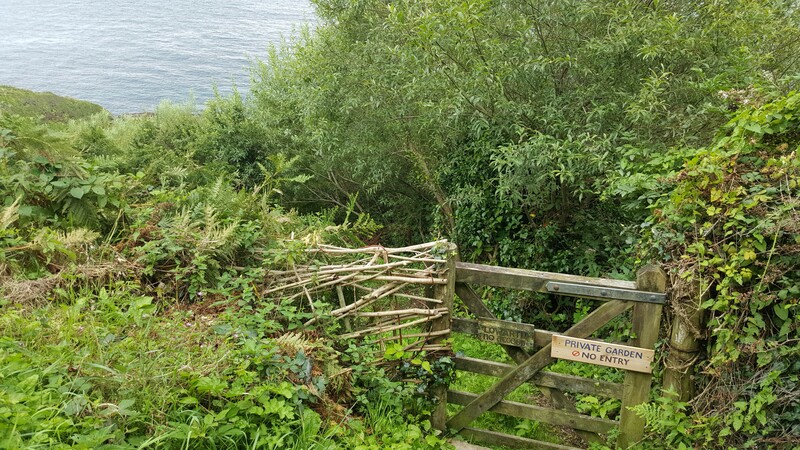 It was very interesting and odd that we met yet again – for the third time – a man we had first met yesterday leaving Polperro for the long hike. 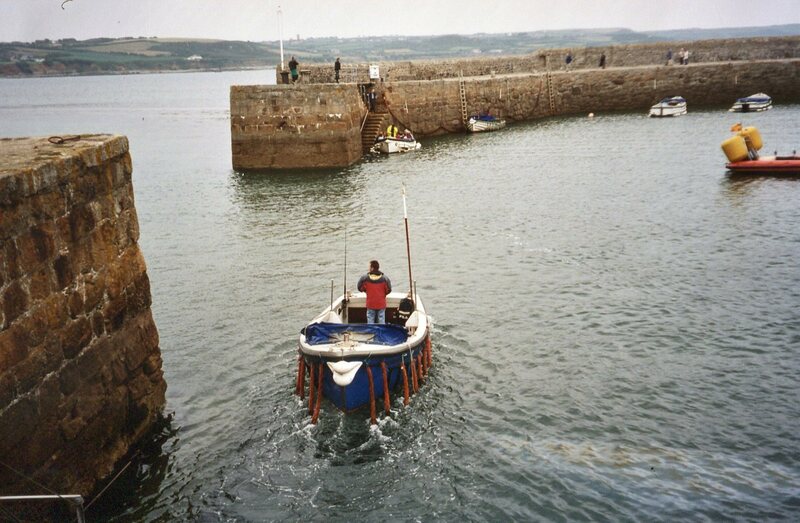 We met him again on the way back to Polperro, and now again in Fowey…small world! 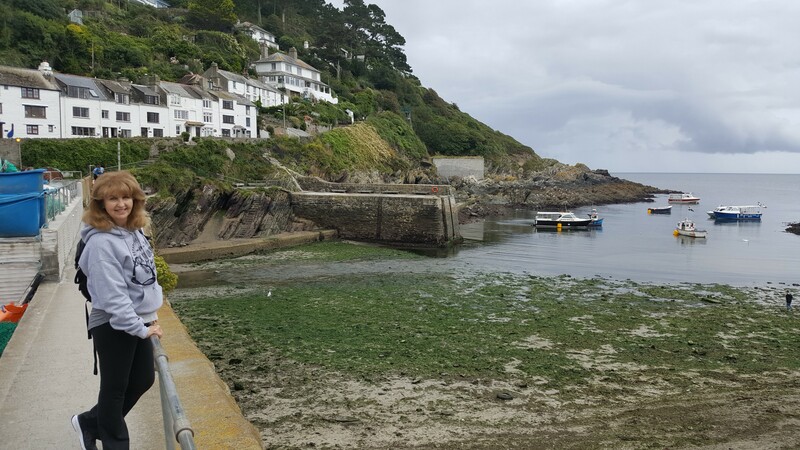 We caught the ferry back from Polruan to Fowey, and then another from Fowey to Bodinnick. Our car park was up an extremely steep road – took about half an hour to reach it. 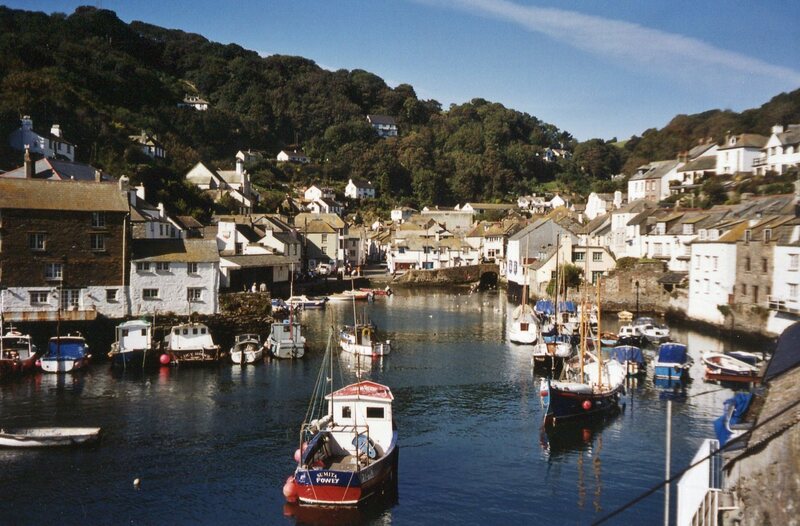 We then decided to take the ferry across to the road to Mevagissey, a supposedly beautiful Daphne Du Maurier haunt. I think she was born around there; there were certainly enough bookstores prominently displaying her books, her photographs and other memorabilia – but Mevagissey was such a letdown. It was tourism taken to the extreme, full of tacky shops and non-descript architecture, not in the least bit picturesque or attractive. 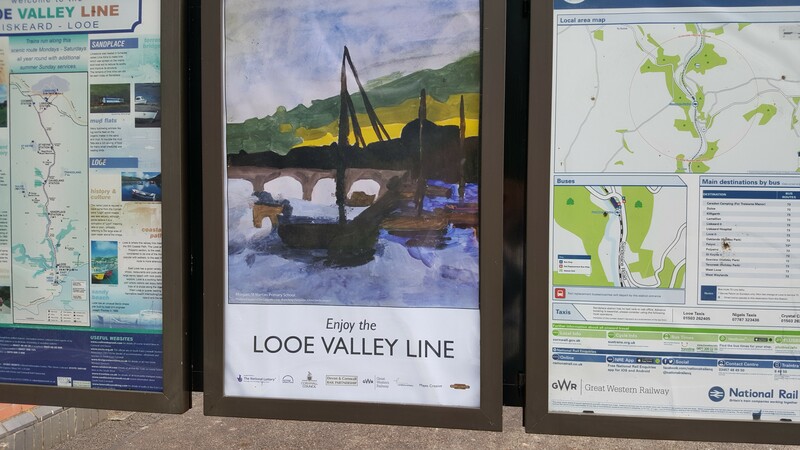 And yet some literature noted it as “One of the prettiest villages in England!” Not!! Even the architecture – houses and shops – was totally undistinguished. We walked around for half an hour, then got our car and drive back – in rush hour traffic – to the ferry, then we stopped to pick up some picnic items for dinner, and so back to our beautiful Allhays to pack. The toilet in our bathroom was a cracker: you flushed, and it sounded much like a steam engine coming to boil … then it was a bang and a BANG BANG BANG CLATTER CLATTERCLATTERCLATTER!! Incredible. The noise seemed to go on for ages. And the tap over the sink also startled you out of your wits when you turned it on, causing another major BANG from the toilet. From the sublime to the ridiculous! Actually, it was funny as hell. We couldn’t help laughing because it was so uniquely LOUD. 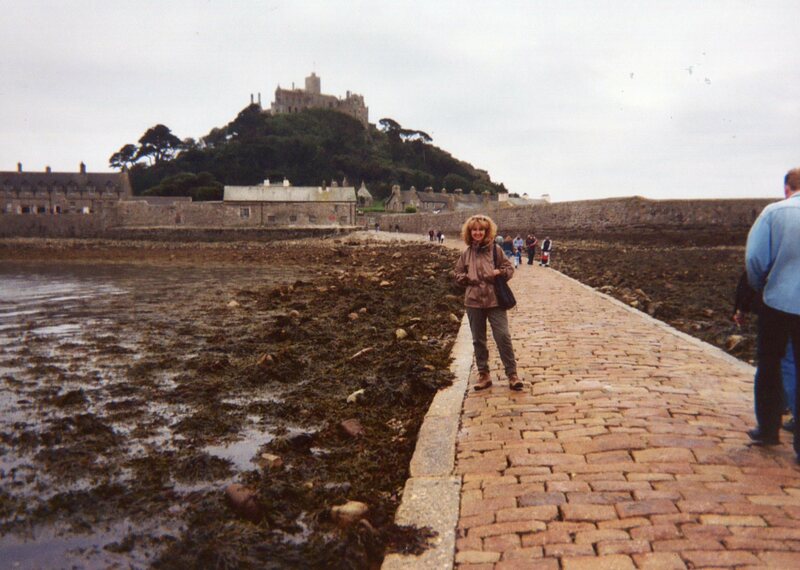 Anyway, we left the luggage and drove into Marazion, parked and took the ferry to St. Michael’s Mount. Filled with history, beautiful and eerie. 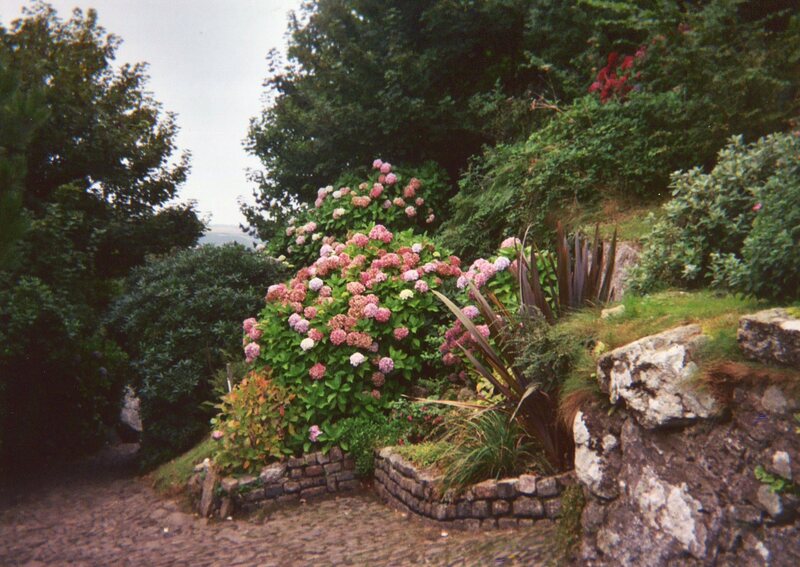 We walked uphill to the top of the mount, and toured the castle and the grounds. The “docents” in the castle (for want of a better word) were charming and knowledgeable. One old gentleman, in talking about Lord and Lady Leven, impressed on us how delightful Lady Leven was (she had died unexpectedly at age 69). “Yes, madam always said ‘good morning’ and ‘isn’t it a lovely morning?’ when she came across us.” In re-reading this, I think: How very Downton Abbey! Then it’s back to our odd little B&B. 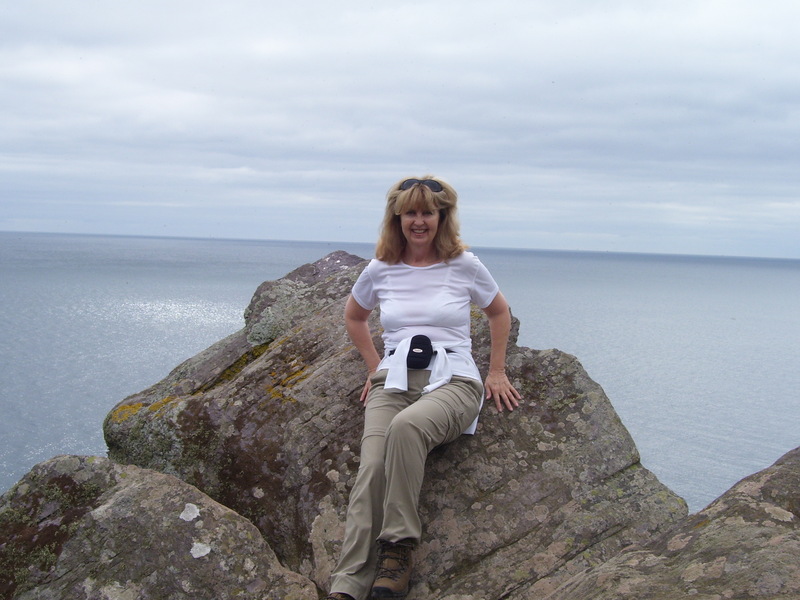 After some discussion, we decided to drive to Land’s End (at 5PM) for a quick 1-2 hour hike across the cliffs there. On reaching Land’s End, we quickly parked and walked through the tourist excrescence fronting the cliffs. There were one or two couples around, and it was very quiet and dim, heavy clouds scudding across the sky. We ambled across the slowly eroding cliffs for about 1-1/2 hours as the twilight deepened, and the wind blew, making it all very mysterious and atmospheric. 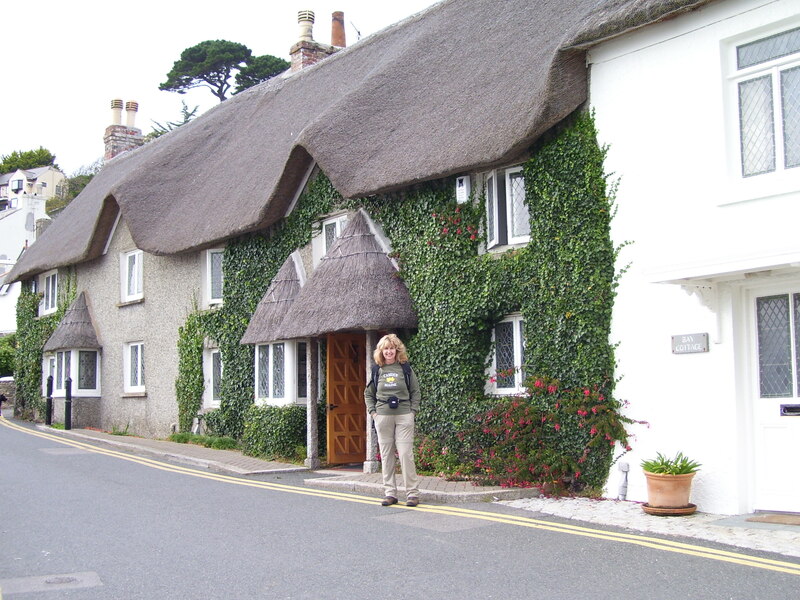 We then drove back 12 miles to Marazion, leaving our car at the B&B, and walked to the King’s Arms for dinner (the dinner took 2 hours arriving!). Then back to our B&B and a good night’s sleep. 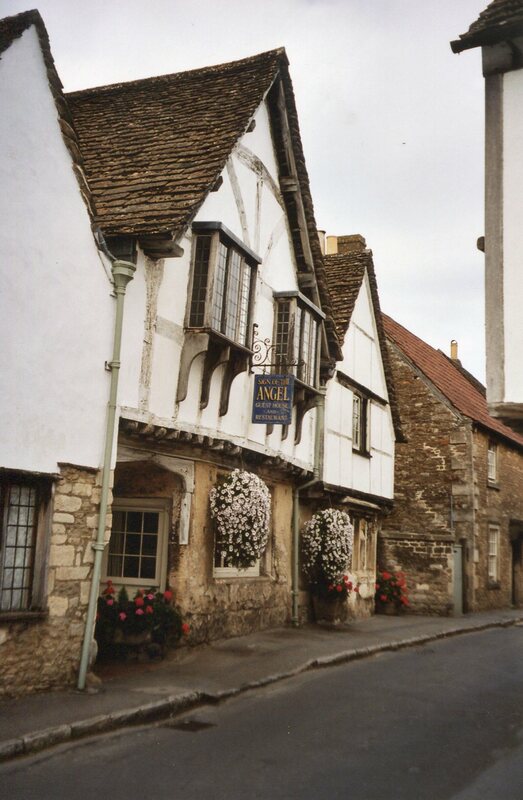 Tomorrow, Lacock and Castle Combe! What an exquisite little town! It’s fifteenth century, and owned by the National Trust. We were lucky enough to get two rooms in The Sign of the Angel, where we ducked down through the doors, and where the floors all sloped. The rooms were enchanting, and as no twin bedded-room was available we opted to each have our own room. Both were en-suite, with big bathtubs to wallow in, which we did! My room was painted deep pink, with burgundy carpet, white iron queen sized bed, feather pillows and bolsters, old antique furniture – and somewhere, there was a resident ghost! It said so on the little marquee in the old hallway. 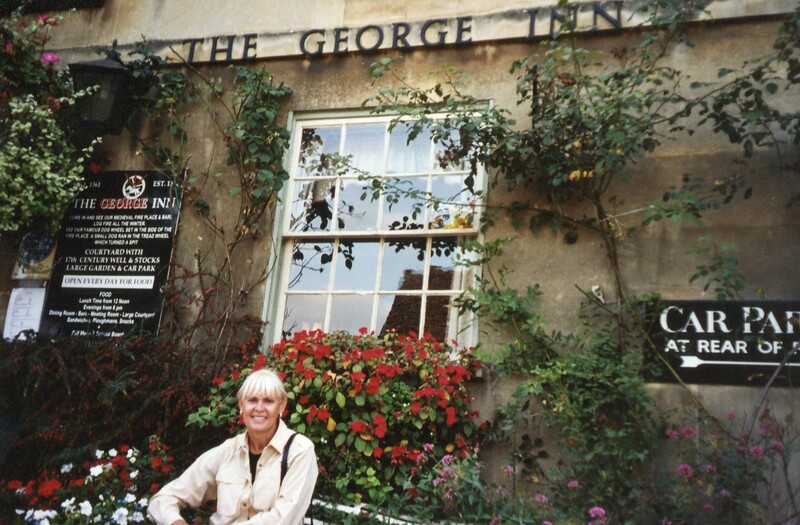 This afternoon, the sun was back out and after wandering around the town (which takes about 5 minutes), Diane and I bought English newspapers and took them to the adorable little pub, The George. 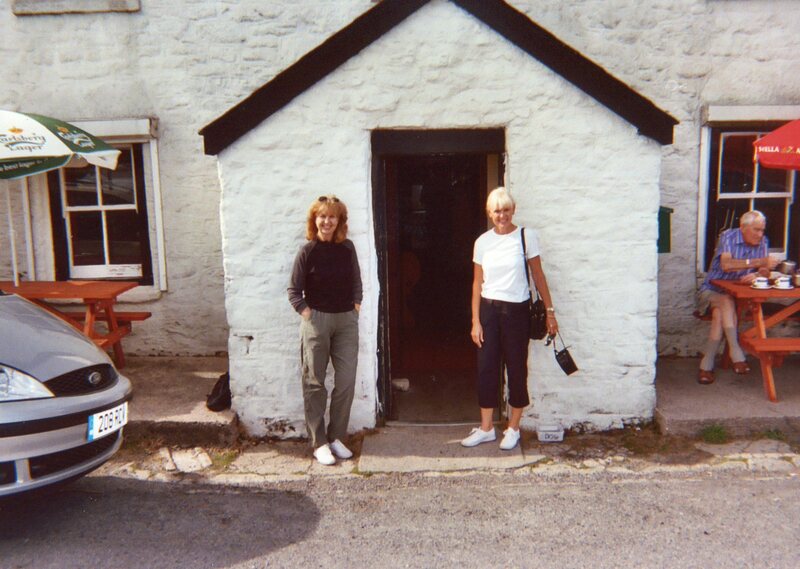 The door was open wide and inside it was everything a pub should be – and more. 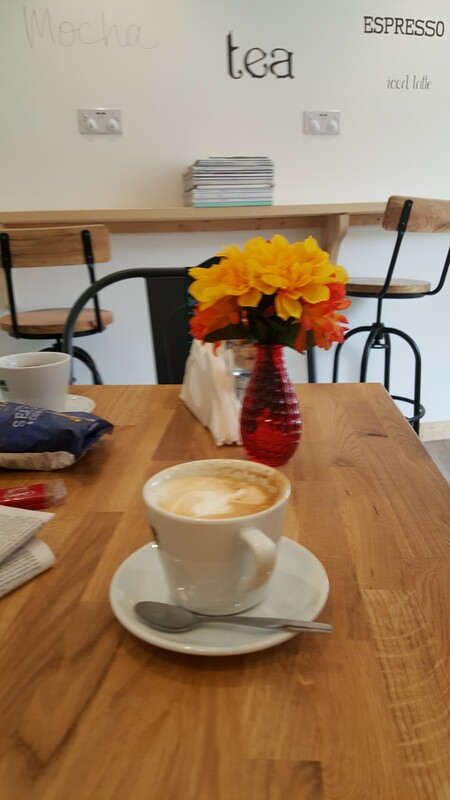 I ordered a cuppa, and Diane an apple cider, and we sat in a corner and I read the Guardian – so very civilized and literary as we were. I loved this place. The windows in several houses were uncurtained and we were able to look into the glowing small yellow-lit living rooms and dining rooms of these ancient homes built in the time of Shakespeare. Then we packed for the drive back to Gatwick tomorrow, (after we see Castle Combe) and I’m sitting up against my feather bolsters finishing my journal (more or less.) I have seen and done much – Diane has really pushed me to do more than I even conceived of– and I am so grateful. It has been really wonderful, and I’ve learned so much about England. 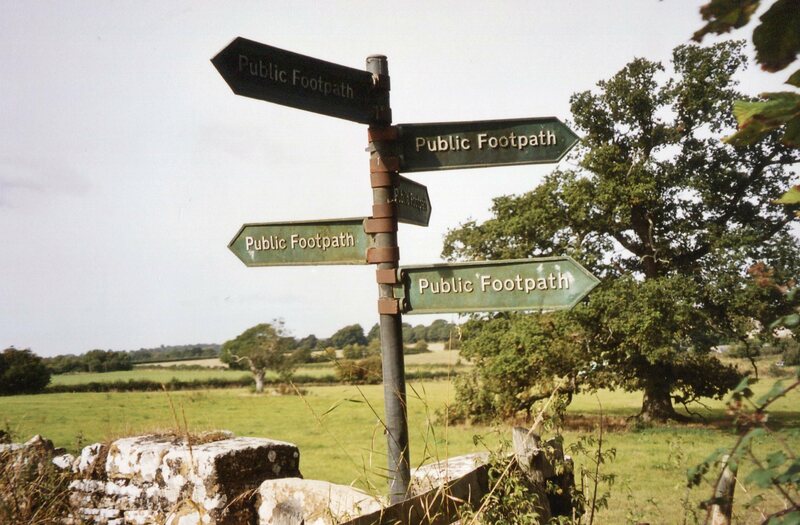 It is good to know there are still the ancient towns, the footpaths (all 1,500 of them) and back roads, the hedgerows, stiles and kissing gates on this jolly old island. Up early to breakfast downstairs… We had porridge with brown sugar and cream! I thought I’d died and gone to heaven (there’s the sign, you see.) We were also offered fresh raspberries, strawberries, blackberries and a hot breakfast. It was a misty morning as we left Lacock for Castle Combe. We took a wrong turn somewhere, but managed to eventually find the road, passing through towns called Tiddleywinks and Shepton Mallet, to yet another entrancing small village. We parked in the car park, and walked down a steep hill right into Jane Austen country. Beautiful (for want of a better word) tiny stone and brick homes and shops framed in ivy, or flowering or berried vines. We wandered about the town in a happy daze, then began our hike through the surrounding countryside. The morning mist slowly began to burn away with the sun eventually breaking through, and the day clears as we walked in quiet woods where beech leaves dropped to the ground, sounding like the patter of tiny feet following us. Then it was back to our lovely elegant pub for a quick lunch. We sat outside in the sunshine, watching as about 30 Japanese wandered into town. Moments later, about 15 bikers zoomed in and parked in the square. Even here, time doesn’t stand still…. People tell me old England, the backroads and coastal towns, are disappearing or changing beyond recognition. Maybe so…but not for me. 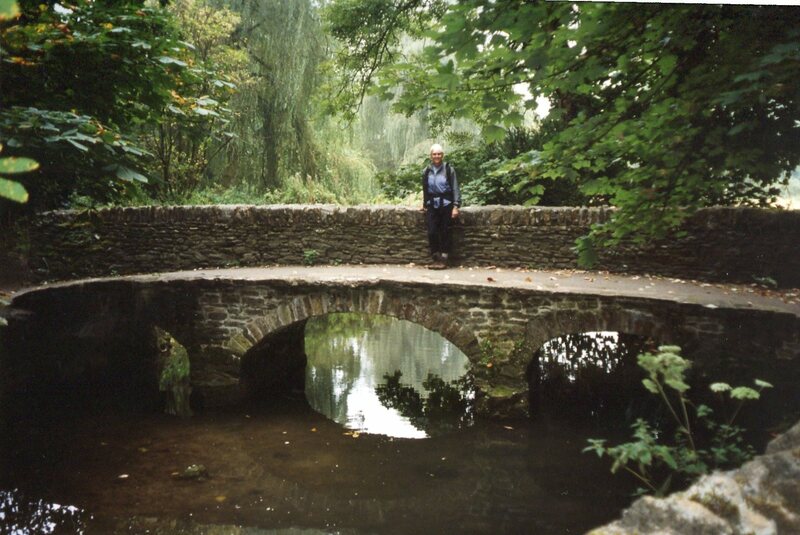 On this hike, England was everything – and more – that I hoped it would be. 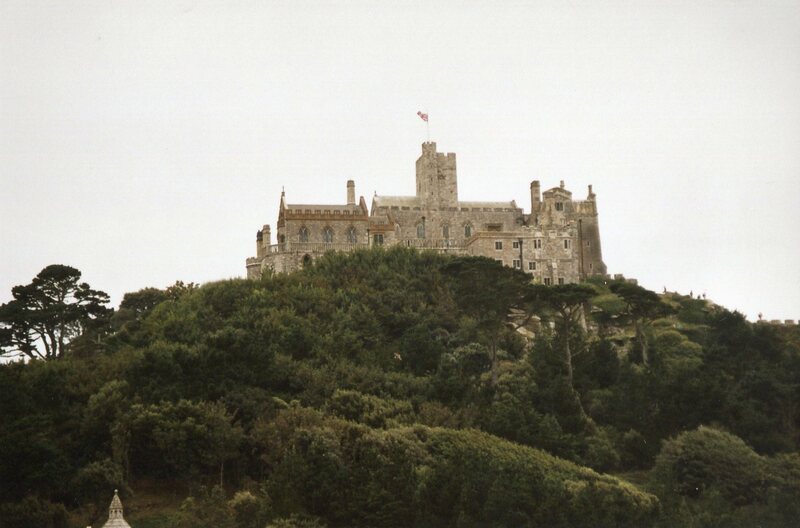 I love England…I always will. 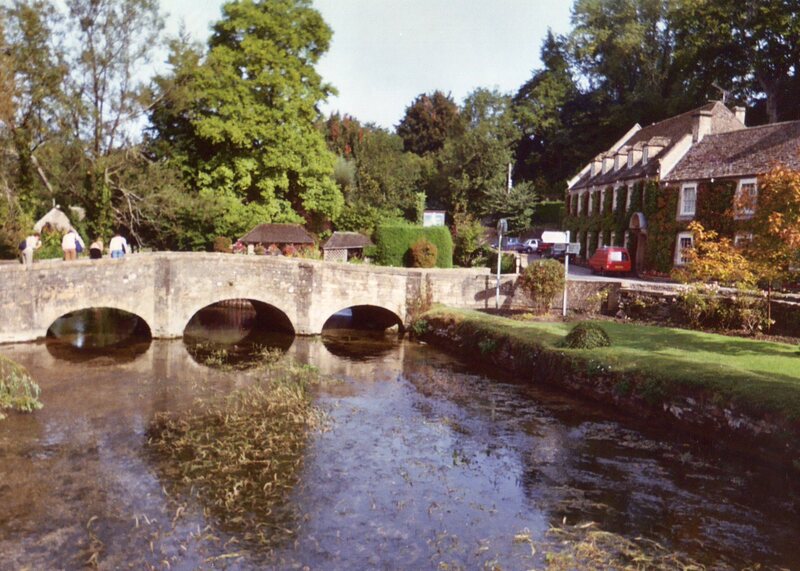 Posted in Uncategorized and tagged Allhays, Bibury, Bodinnick, Bourton on the Water, Broadway, Buckland, Burford, carpe diem, carpe diem rosemary, Castle Combe, Chudleigh, Cornwall, Cotswolds, Cotswolds stone, cricket, Dartmoor, Dartmoor heath, Dartmoor National Park, England, fishermen's village, footpaths, From the deep country to St Michael's Mount and the Sign of the Angel, heading for the Cotswolds, Hiking in England, hiking the cliffs to Polperro, Horse & Hounds, Lacock, Lady Leven, Land's End, Laverton, Liskeard, Looe, Lord and Lady Leven, Lower Slaughter, Lowerfield Farm, Marazion, masters of the hunt, Mevagissey, Naunton, Noughts & Crosses Inn, Polperro, Polruan, public footpaths, seagulls, Snowshill, St Michael's Mount, Stanton, Stanway, Stowe-on-the-Wolde, the causeway to St Michael's Mount, the ferry to St Michael's Mount, The Sign of the Angel, The Swan Hotel, the Windrush, Upper Slaughter, Warren Hill Inn, Windrush river. Bookmark the permalink.